The AGM was last Thursday at the Garden Ladder on Green Lanes. Lots of ideas for events over the coming year and gardening sessions will continue with Alison. There will be a dedicated community website for the friends group at www.fairlandpark.org (which will go live soon). 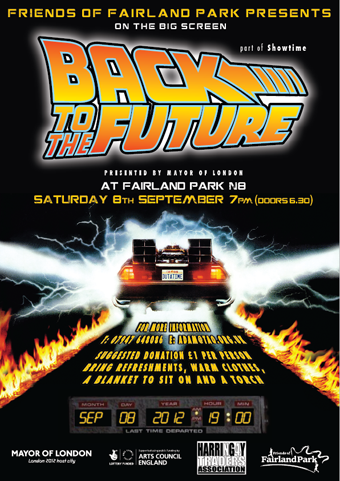 Open air cinema returns to Fairland Park! 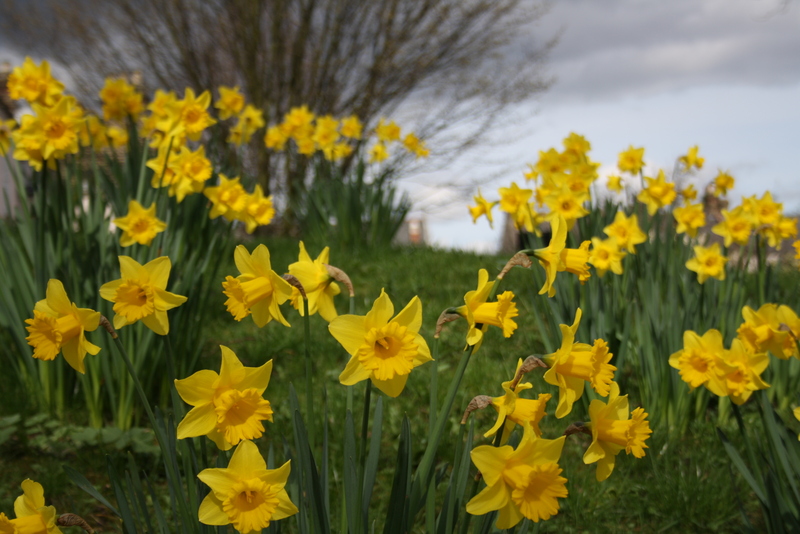 The first Sunday of each month we aim to get together to tidy up the park and do a little gardening. Today was very enjoyable and a good turn out from local park users. It starts at 10am. Pop along and join us next month. Thanks to Liz for the photos & Alison for organising. 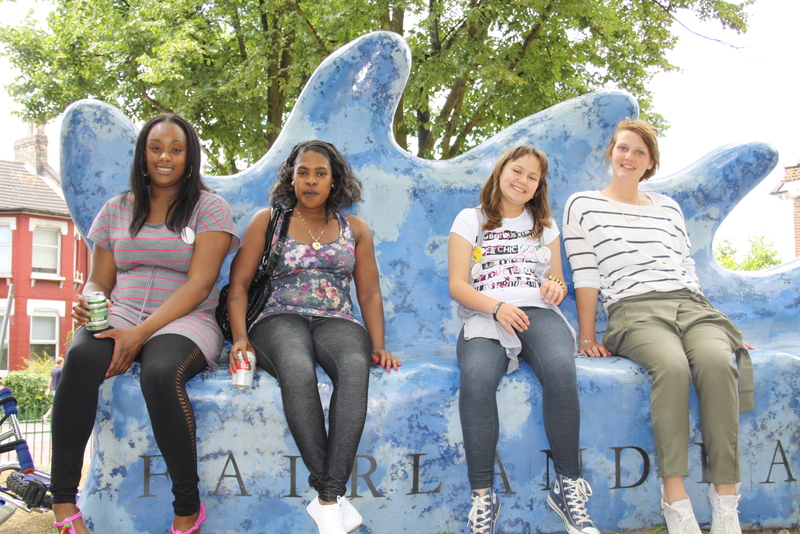 Fairland Park has had a friends group for a number of years. 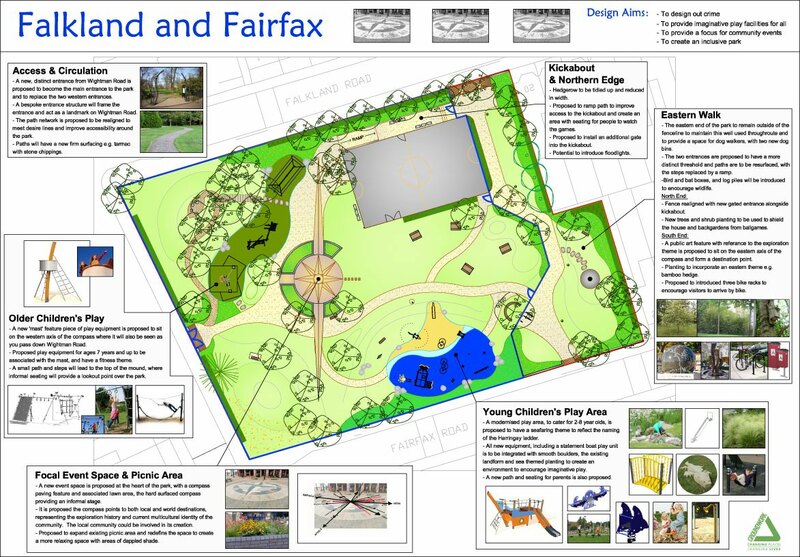 We worked with the council on the parks recent redevelopment plans, fund raising and implementation. Which went very well; over 200 enthusiastic revellers not put off by the wet weather before hand. 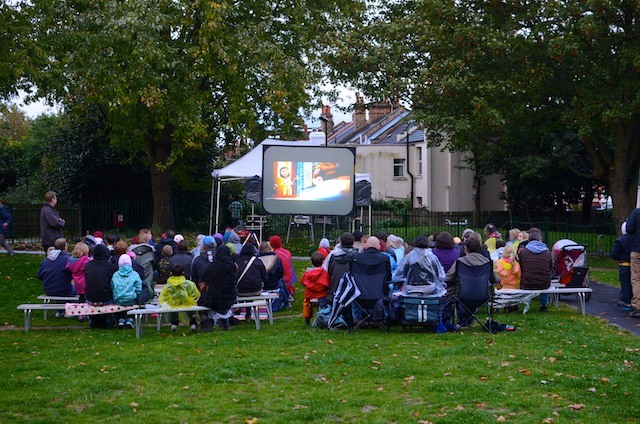 There’s something special about an outside film experience! Well done to Adam Coffman of the Friends group for organising this. He has been absolutely determined to see this happen (in the park rather than a church hall)! 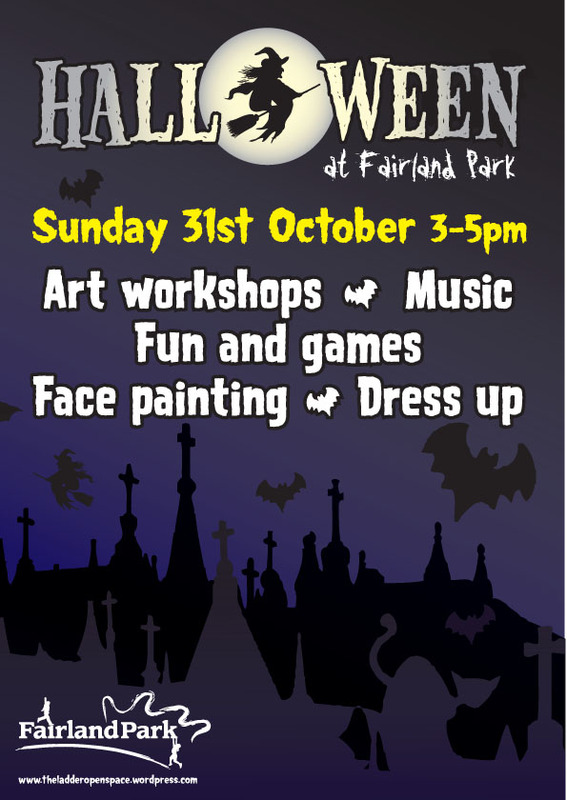 Fairland Park, is located between the rungs of Haringey’s famous “Ladder” of streets between Wood Green and Finsbury Park. It exists to provide a horticultural oasis of scent and colour to enhance the local urban environment for the benefit of all, whilst providing suitable recreational facilities to encourage a range of healthy, educational and leisure activities within a clean and safe environment. Fantastic day helped by incredibly good weather. 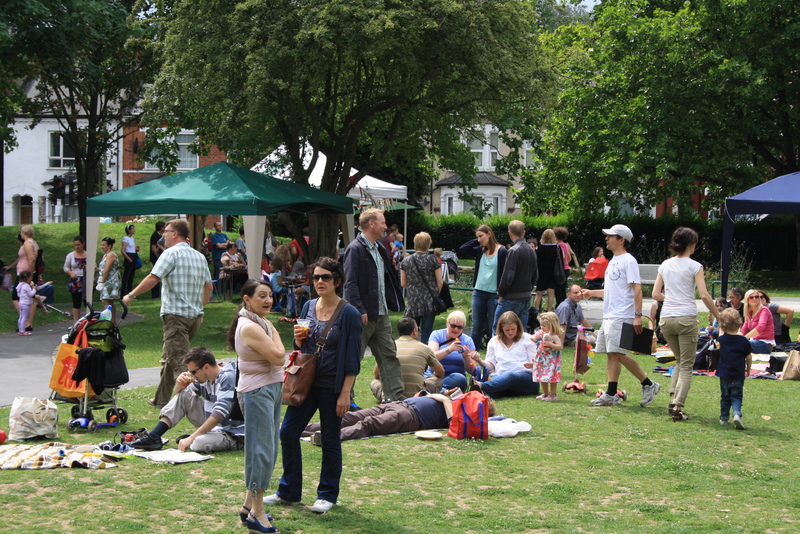 Event ran over by 2 hours, with everyone enjoying themselves in the Sunday sunshine. 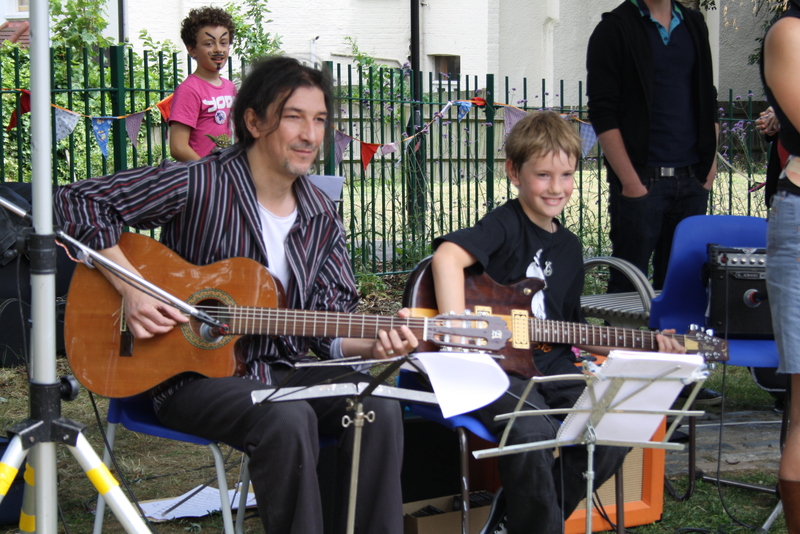 Had an excellent variety of live music and plenty of entertainment for the kids. Thank you all! 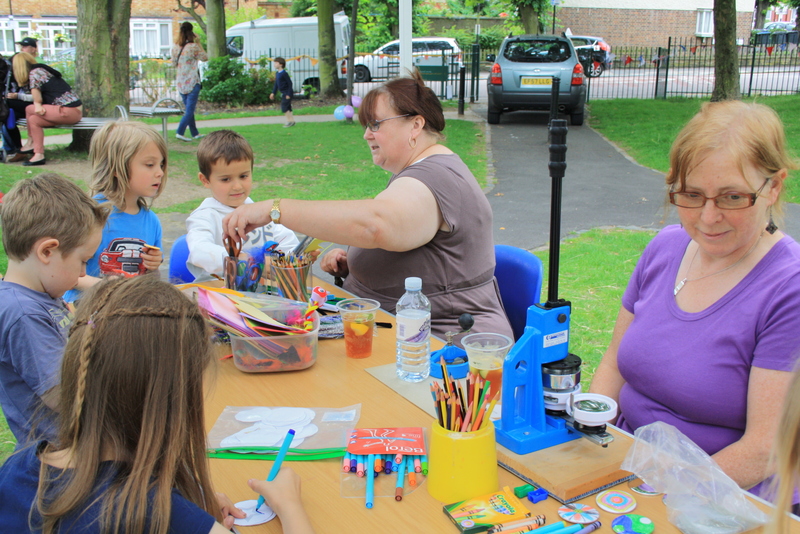 Residents give the park a spring clean! Today a good number of local residents turned up to clean Fairland Park. Many thanks to Darrell Osbawn for organising this via HOL. 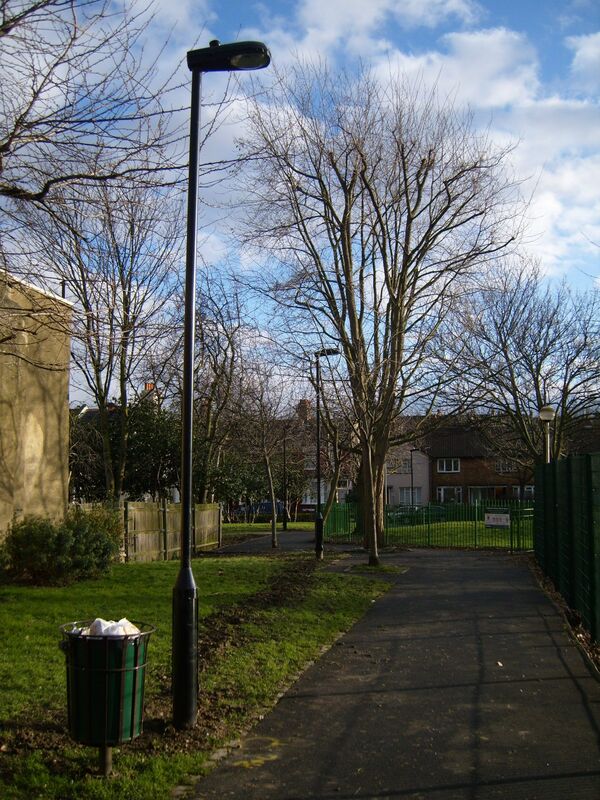 Steve Hall, our area parks manager has been emailed to let the Parks Hygiene team know that there are an extra 10 bags of litter picked rubbish that needs picking up. As well as emptying the overflowing bins. The volunteers pictured below also swept the whole area. 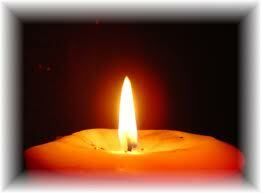 Bring your singing voice and a candle. Mince pies & mulled wine provided. 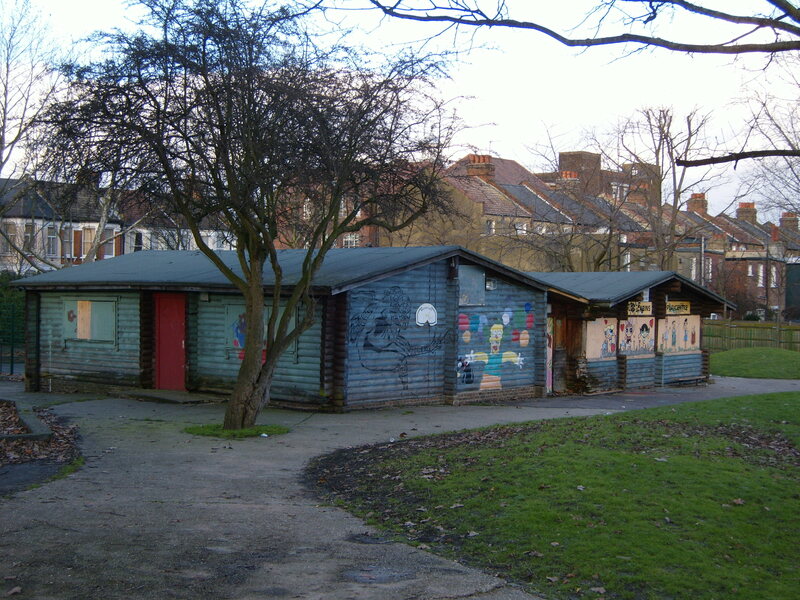 The Falkland Centre (entrance from Frobisher Rd, by Harringay Passage). 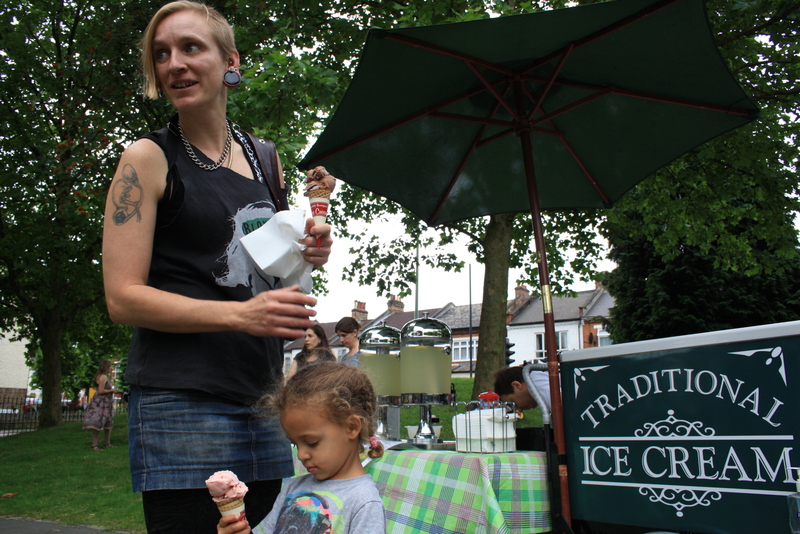 Great day at Fairland Park on Sunday, with our Summer Party and opening event for the park re-development. Jatin had a very important role on the day as one of the children to cut the ribbon at the opening ceremony, along with Caci. See below. Lots of entertainment on the day, sport, art workshops, making bird boxes. A lot of happy, happy people! 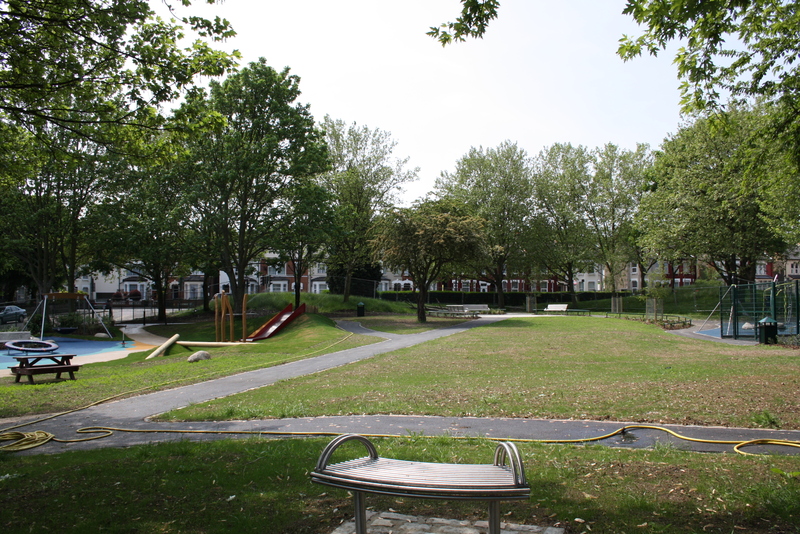 There is also a ‘ribbon cutting’ at 3pm to celebrate the parks re-development: Haringey Council in partnership with Friends of Fairland Park. We will need help setting up for the event on the day. We will be in the park from 9am. We will also need a hand clearing away at the end of the day. Fairland Park opened up to the public this week after months of being closed for the re-development works. I’m pleased to say it has been packed out all week. Feedback has been very positive. We also had an inspection of the park by Green Flag judges. They were very impressed with what they saw and believe the criteria for a Green Flag award have been met. These awards will be officially announced in July. Update July: as expected Fairland Park has indeed won a Green Flag, which now sits upon a flag pole within the park. Well done to all who contributed in this effort and there are many of you! How the park re-development was funded. The cost of the re-development was approx £270,000. 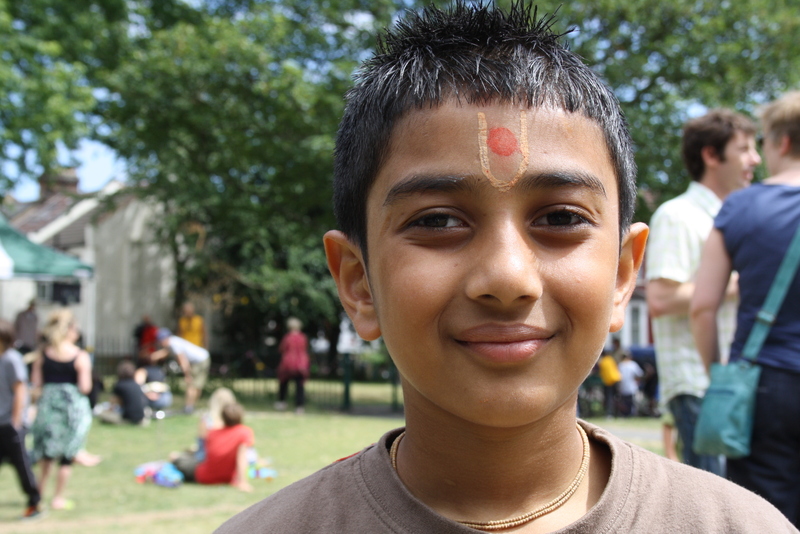 Of this the Friends Group raised £85,000 ( from Community Spaces and London Marathon Charitable Trust) ; the council contributed £150,000 and Groundwork London raised £35,000. 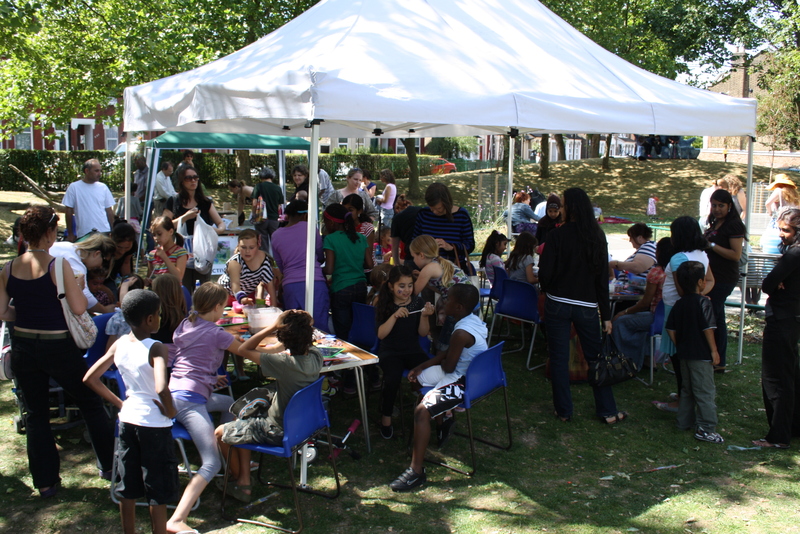 We have our annual Summer Party on July 18th, 12pm-4:30pm. 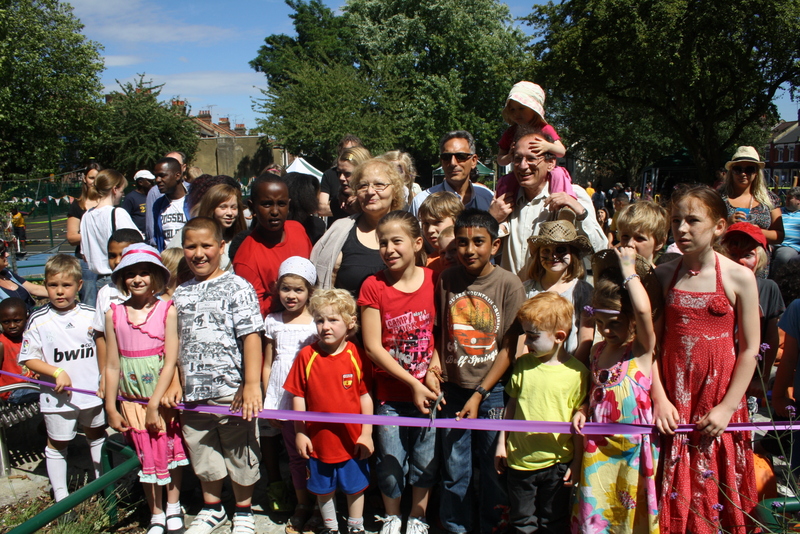 Here we will also celebrate our new park with an Opening Event at 3pm where two local children will cut the ribbon. We look forward to seeing you all. We will be funding various activities for the party. More details will follow shortly. Many meetings later, a detailed consultation process and a plan for the site on the table and with successful funding bids, the work was finally able to begin February 2010. The results speak for themselves. We now have a wonderful little green space for our community here in Harringay. 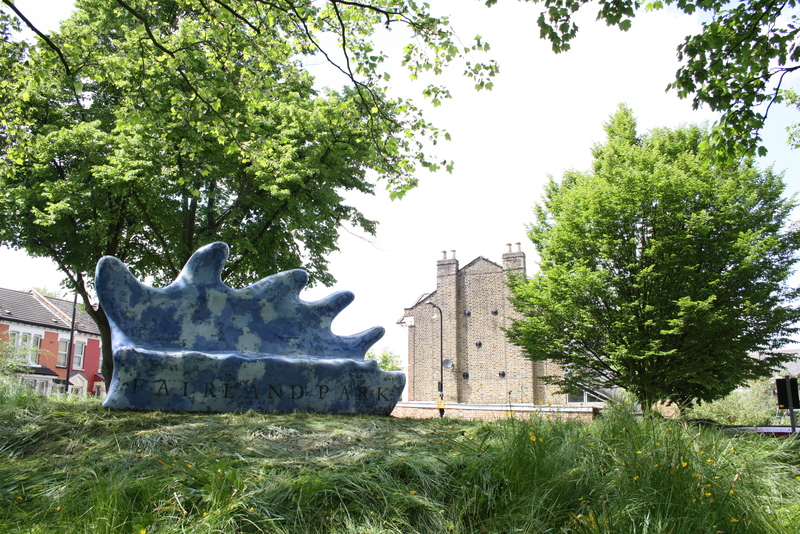 The above ‘art’ was commissioned by Friends of Fairland Park and funded by Make the Difference. 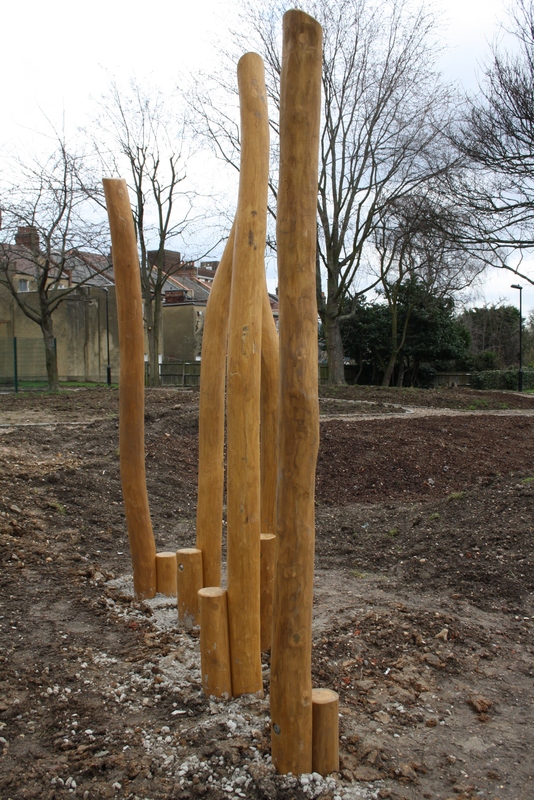 It was finally installed this week by Finn Stone , a local artist based at Park Ridings, N8. Finn was chosen from a number of artists who made presentations. And it comes with a view …. Redevelopment: The re-development of Fairland Park has been completed. It will open to the public 7th/8th June. This is designed to allow the new grass areas time to establish. Yes, we do need some rain! 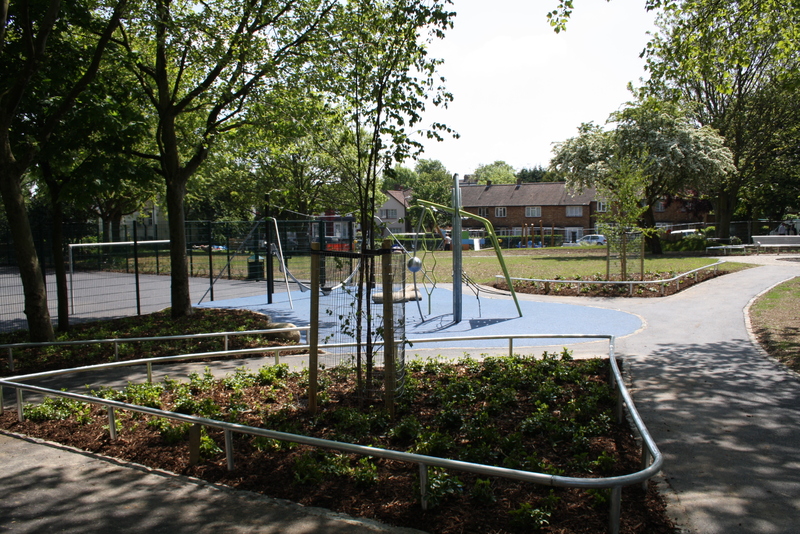 Fairland Park is looking fantastic, newly landscaped and with lots of new play equipment and fancy park furniture installed. Dare you to try the new skate rail ! – the only one in Haringey. Opening Event: this is planned for Sunday July 18th. More details to follow. 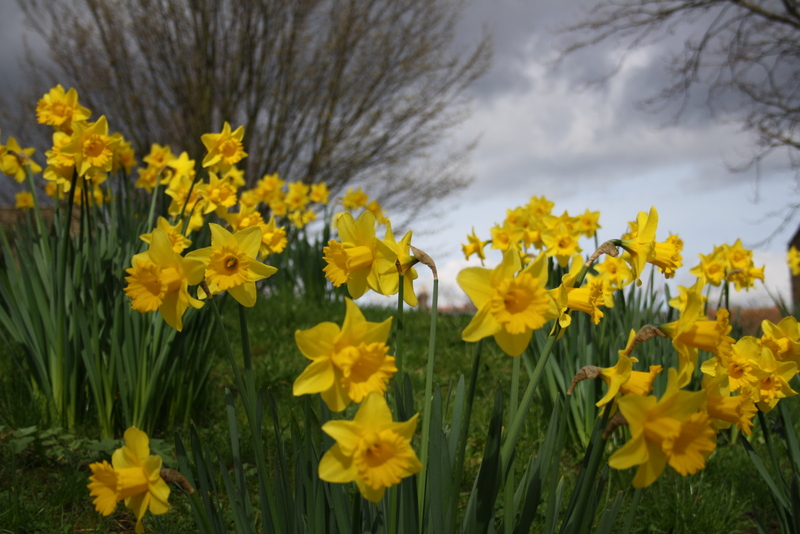 But of course the daffodils are the most beautiful of all. Paula & Sheenagh are the artists who have been commissioned to produce the artwork for the park’s central area. It will be 12 sq metres of Portland stone, some sand stone and mosaic. Below is a sketch outline incorporating ideas from local residents who came along to the ‘Design’ workshop, held at North Harringay Primary in February. 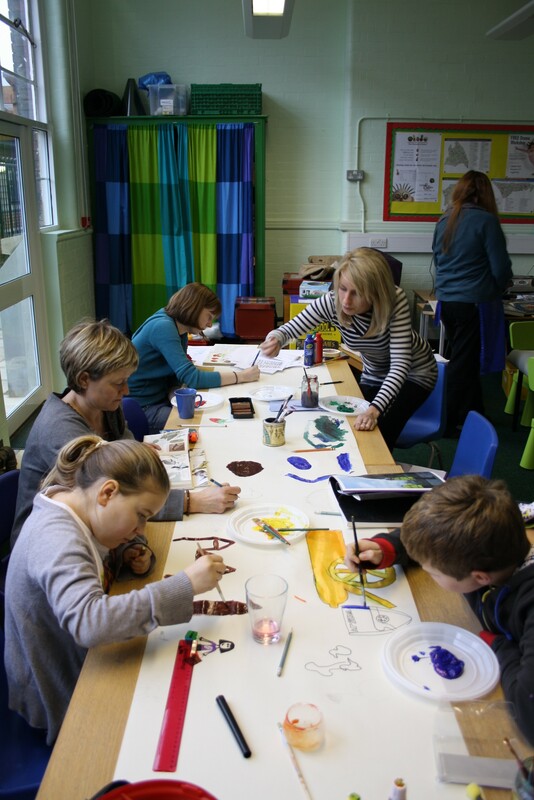 Below are a selection of images from both the ‘Design’ & ‘Make’ workshops. Colourful mosaics made at today’s workshop, which will become part of the larger piece being created by Paula & Sheenagh over in their Bow studio. 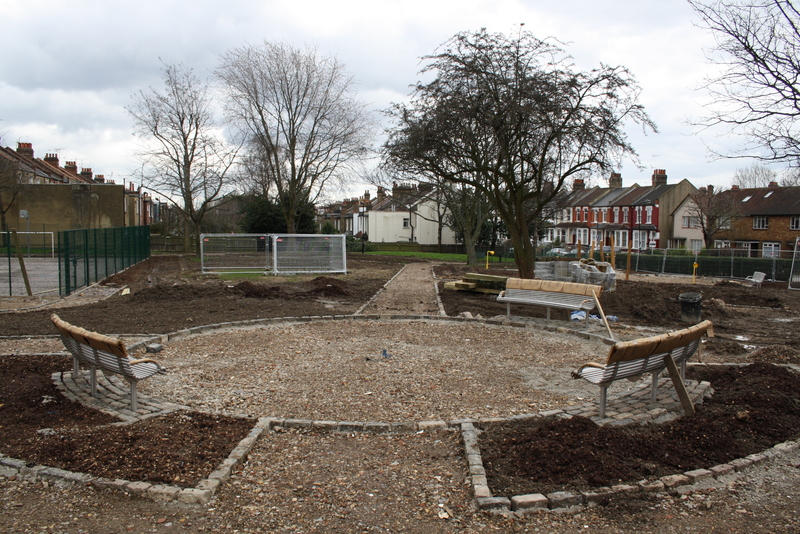 Pictures above taken a couple of weeks back but show the extent of the hard re-landscaping going on at Fairland Park. English Landscapes are managing the project. Thankfully they have had better weather recently and so have been able to continue apace putting in the edgings for the new pathways, re-laying the ball court foundation and moving a lot of soil around as part of the re-landscaping! They are about 5 weeks into a 10 week project. Good news. Fairland Park re-development starts this February. The works will run for 10 weeks. The charity Groundwork will continue to manage these works and have commissioned a company (with the council) to install the play equipment, park furniture and some landscaping. An art feature has also been commissioned. The artists are running two workshops to which people within the local community can get involved with the design. 1. Tell us the word/script for HOME in your language. 3. Thoughts and images of the present area – what activities and places are important to you? What bits of the new park will be important. Play areas, nature, dog walking, picnic seating? 4. Ceramic shards – Please bring broken/cracked pottery or tiles, which could have been dug up from your garden or just collected – as much as possible in any colour or pattern. 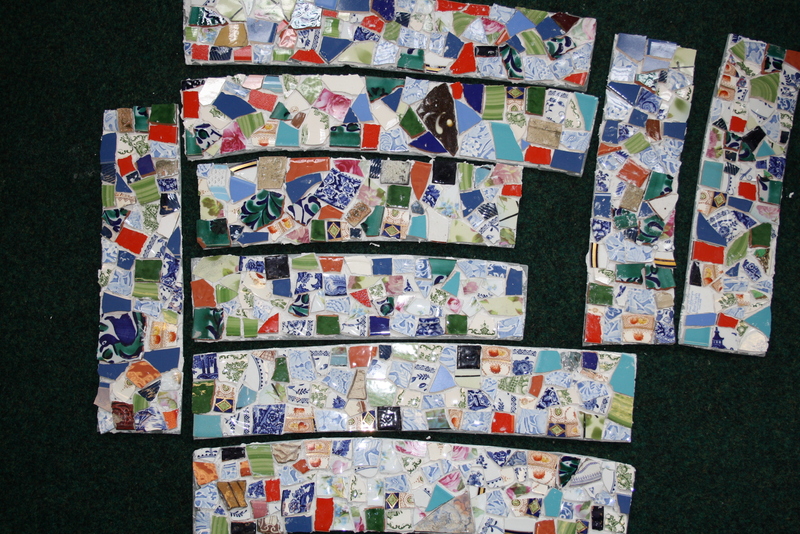 These can be incorporated as mosaic pieces into the final design. 1. Help make the piece by having a go at carving the stone and laying the mosaic tiles. Please also bring more ceramics to use! See this post for the design layout for the park re-development. Note, some details have changed with the play equipment and it’s location but the layout is generally the same. Thank you to all the people who came along to the Fairland Park AGM. A report giving both a summary of the last 12 months and plans for the next year can be found below. It includes information on the re-development of the park as well as more detail on the £95,000 we raised. Adam Coffman is Events Officer leading up the newly formed Events Committee which already has 5 new members. If you’d like to join please contact Adam. 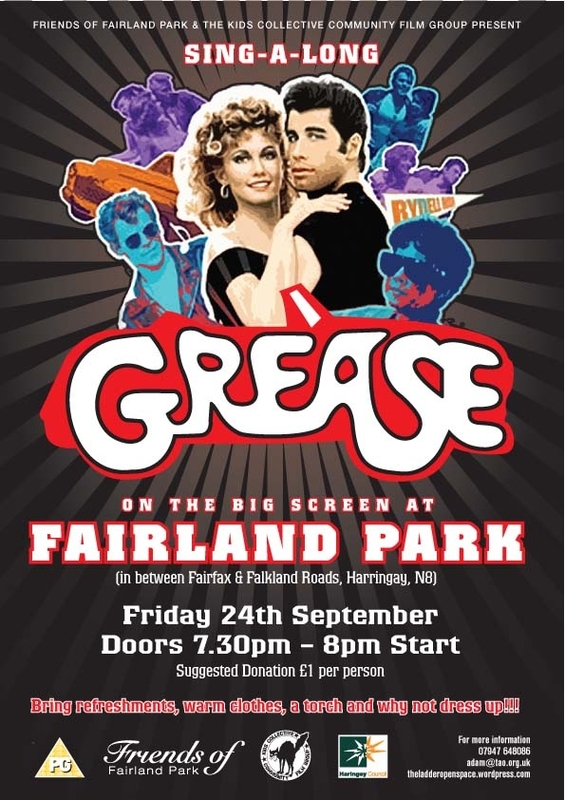 The last twelve months has been a fantastic year for Fairland Park. 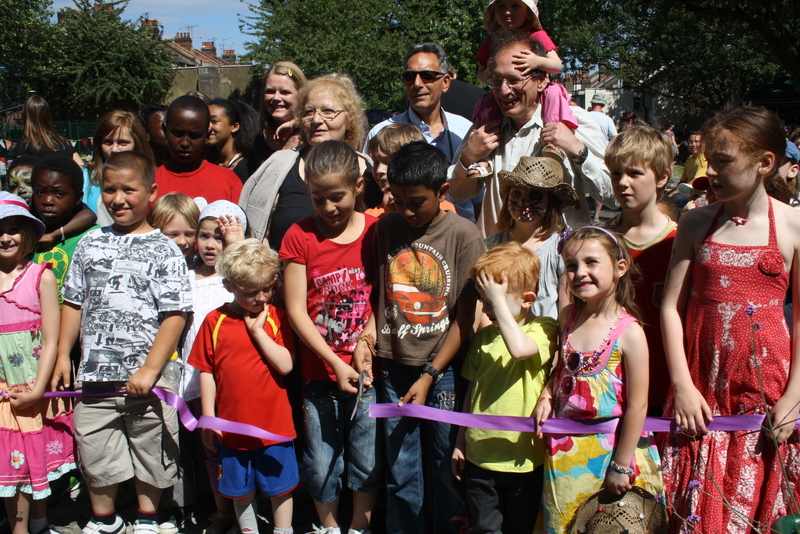 The children of our local schools chose the new name and the council changed the status of the open space to a ‘park’. This gives us more clout with maintenance issues and keeps the park on the council’s radar more than ever. The latest ‘working group’ meeting on July 13th was very positive. Karen Partridge of Groundwork praised the Friends committee for fund raising £85,000 towards the re-development project. The council has committed £150,000 on top of that to give us a total of £235,000. Groundwork has an application in with Veolia for another £35,000 which would basically pay for their project management fees. They will hear back by September. Update: (10/08/09) Groundwork have been successful with their Veolia bid so we now have all funding in place. That’s a total of 270,000. 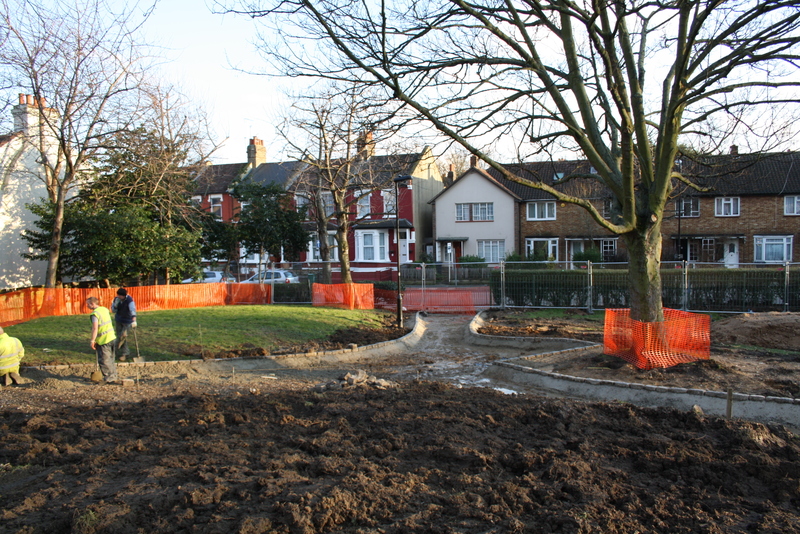 The works on the park are scheduled for a December or January start and should be completed by March 2010. It has been a long haul but we hope to finally be there by spring next year. 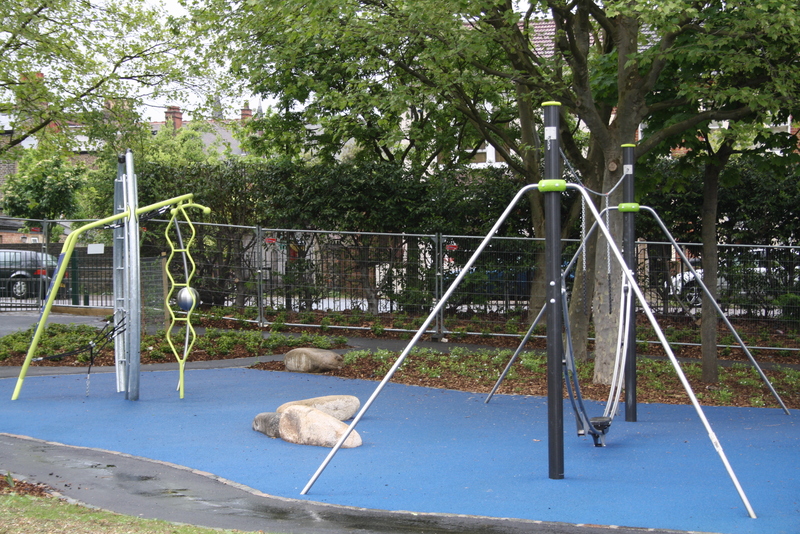 (Some examples of play equipment are attached with this summary). 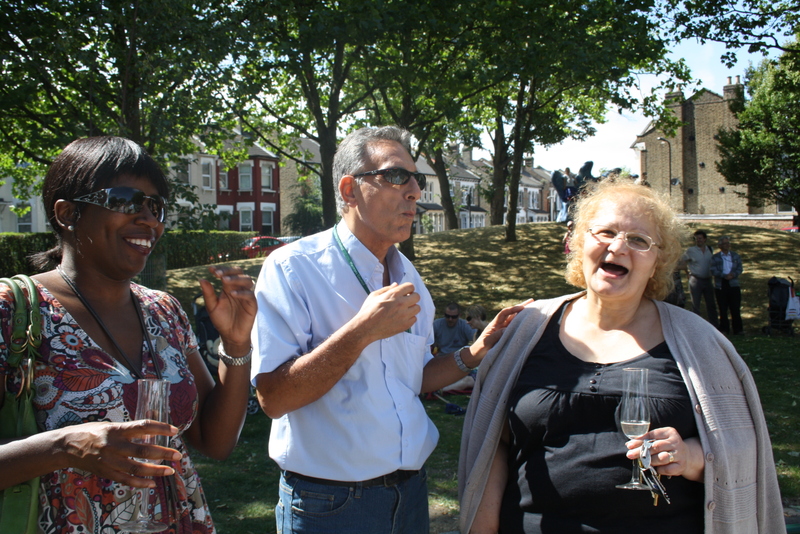 On July 12th the Friends Group had their annual Summer Party which by all accounts was very successful with many people joining us for the day. 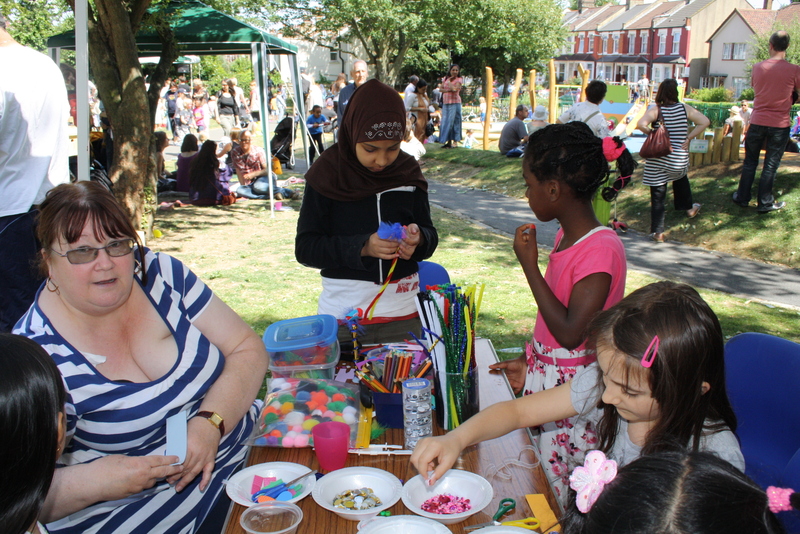 We were successful in raising £5000 in funding from East London Community Foundation (ELCF) of which £1300 was used towards this community event. Donations of £120 were collected on the day. 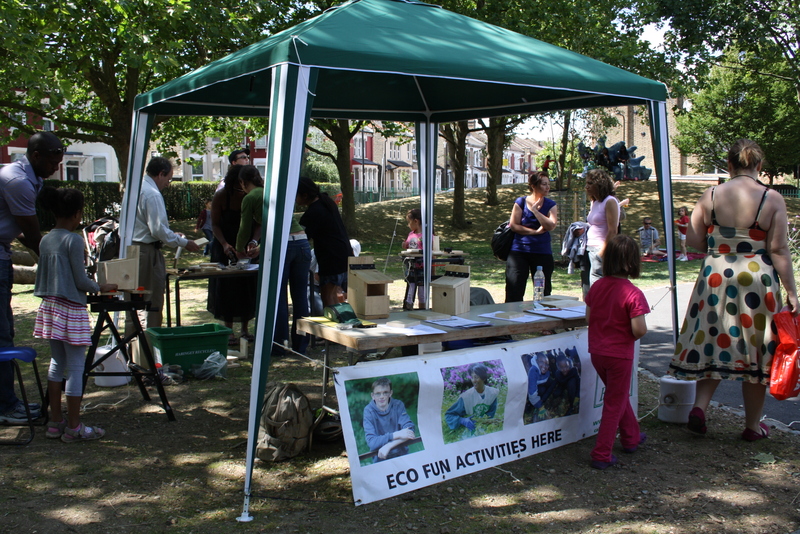 Of the remaining ECLF monies a parks notice board, Gazebos, a badge maker and Dr Bike sessions have been funded. Year 1 monies totalling £4375 have been fully committed. Year 2 monies of £625 will be released by ECLF once they have received our final report for the year 1 allocation. Make the Difference monies of £5000 has been assigned to an art feature for the park. 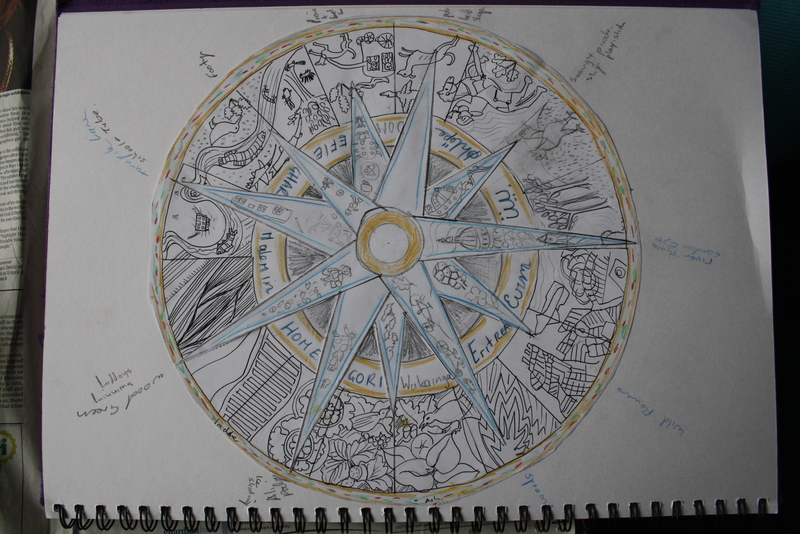 This is being created by a local artist called Finn Stone and may well be installed before October. Accounts: The Friends Group currently has £303 in the bank. Deborah has the detail on monies that have come in and out of the account over the previous year. There are currently two main areas of focus for the Friends Group. The first is the re-development of the park and the second is events. The committee has raised £35,000 from London Marathon Trust (LMT) and £50,000 from Community Spaces (lottery money) which has been committed to the play areas. 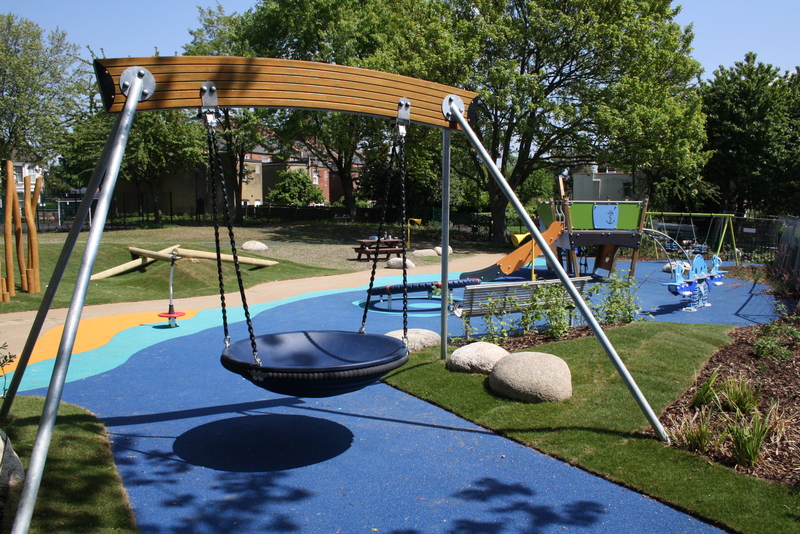 The current Chair and Secretary are required as named fund raisers to make sure the development of the play areas are completed as stated within the funding applications. 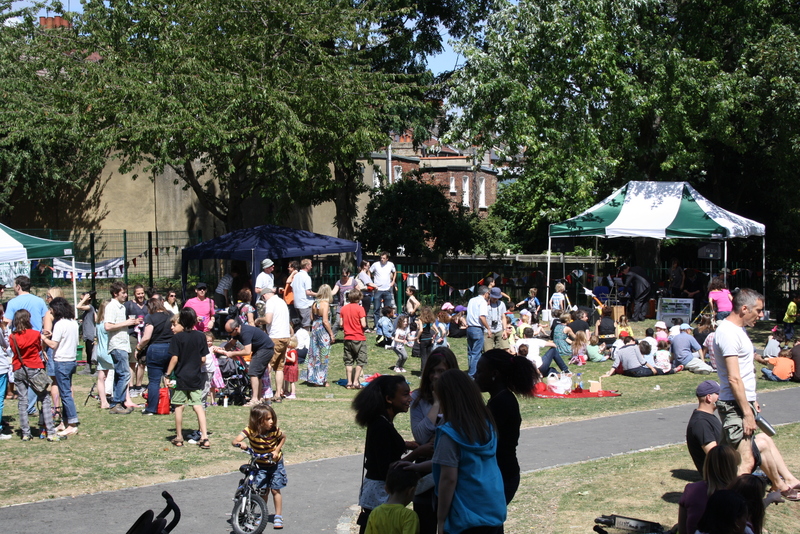 This requirement of LMT & Community Spaces applies over the course of the park’s re-development. This will therefore be the first priority over the following months. We want to see further success with events, particularly those involving other community groups. 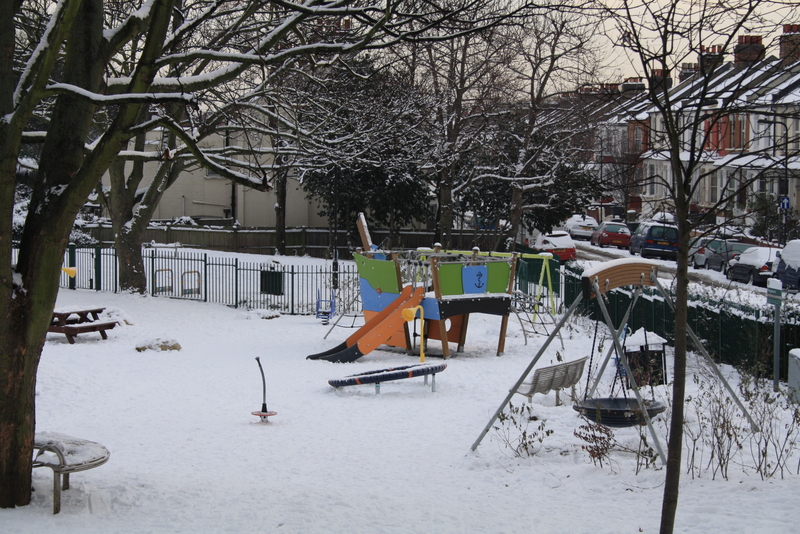 Once the re-development has taken place it is hoped the local schools for example will use the park more often. 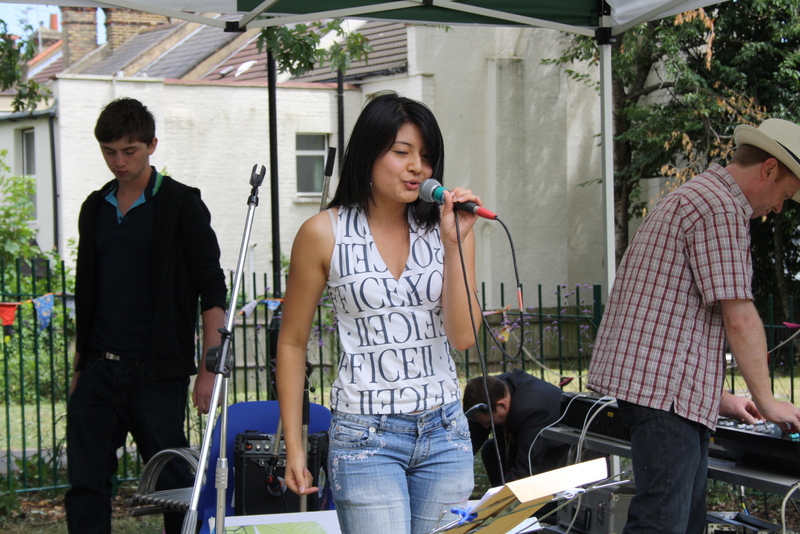 Youth led events would also be excellent as there are few youth facilities or events within the ward of Harringay. 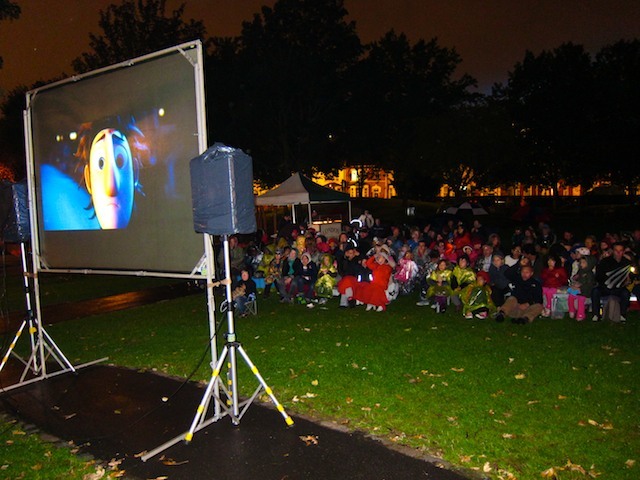 On September 19th there is a film evening and next spring an opening day is planned once the re-development of the park is complete. With the above in mind it is proposed that an Events Committee is set up to lead on the above planned events, as well as developing other ideas throughout 2010 and beyond. We would like someone to lead on this and to encourage other members to join on the Events Committee. The ‘Open Day’ in particular will be very important. We may be able to move on this at this AGM or develop the idea further at a later stage. I’d like to thank Deborah Peacock and Ruth Edwards for their commitment this last year. Ruth is resigning as Secretary but would like to get involved with the Events Committee. Steve Burdekin would like to take this role for the following 12 months and should be warmly supported by members of the Friends Group. I’d also like to thank Frances Walsh and Adam Coffman for their help with fund raising for the Summer Party and particularly Adam for all his work for the event itself. Thanks also to Sandra and Karen of Groundwork who have worked closely with the Friends Group taking the re-development project forward. Looking forward very much to next spring and a beautiful new park for our community, something our area richly deserves! 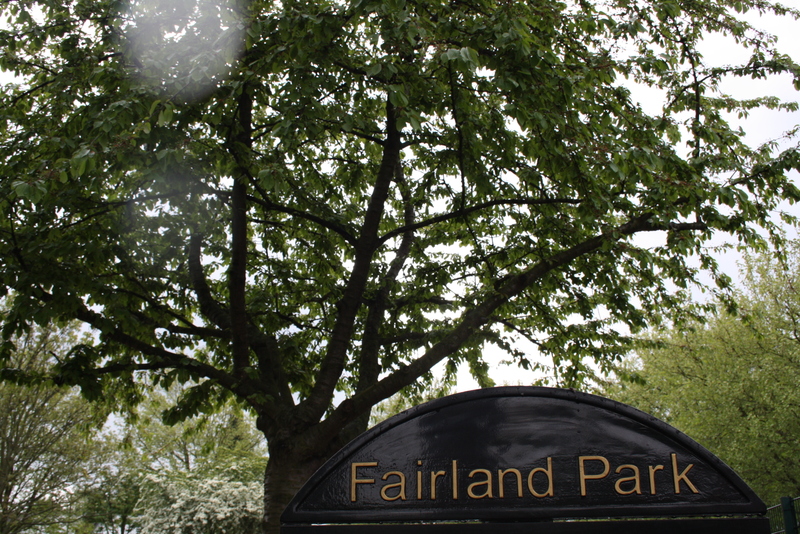 Fairland Park AGM will be at the Falkland Centre 7pm, Thursday 23rd July. 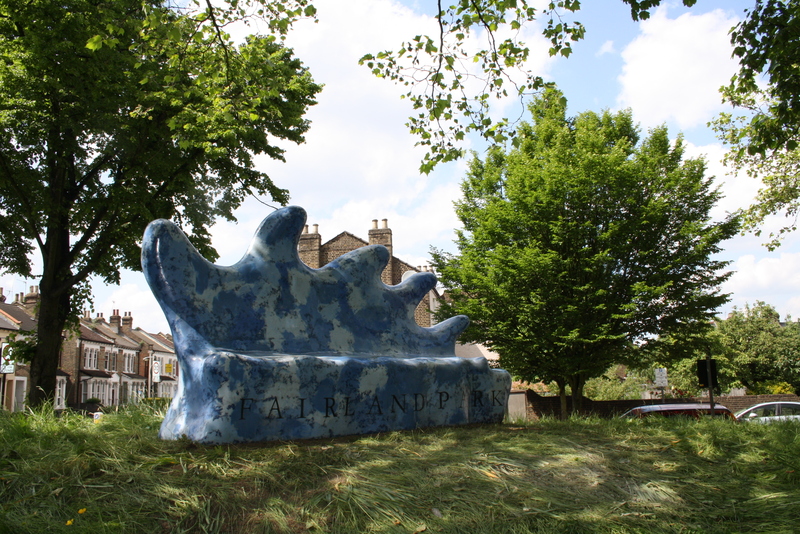 The entrance to the Falkland Centre is on Frobisher Rd, by Harringay Passage. The Fairland Park Summer Party is Sunday July 12th, 12 – 4pm. We are meeting Wed June 3rd, 8pm at The Salisbury to organise the above event. We would appreciate your help with this community event no matter how big or small. If any musicians would like to come along and play please contact Adam or Matt via this discussion on HOL. 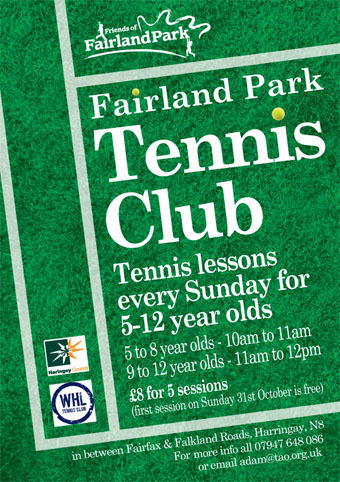 News update for Fairland Park. 1. 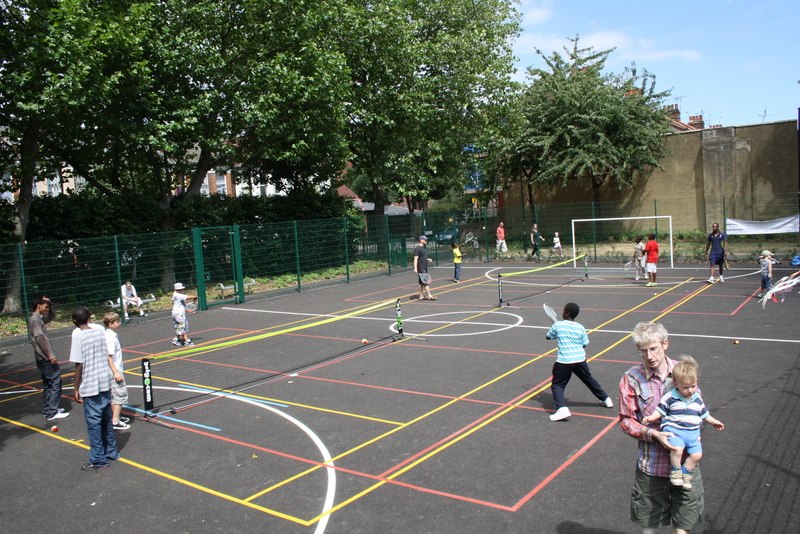 We have had success with a funding bid for £5000 from East London Community Foundation. 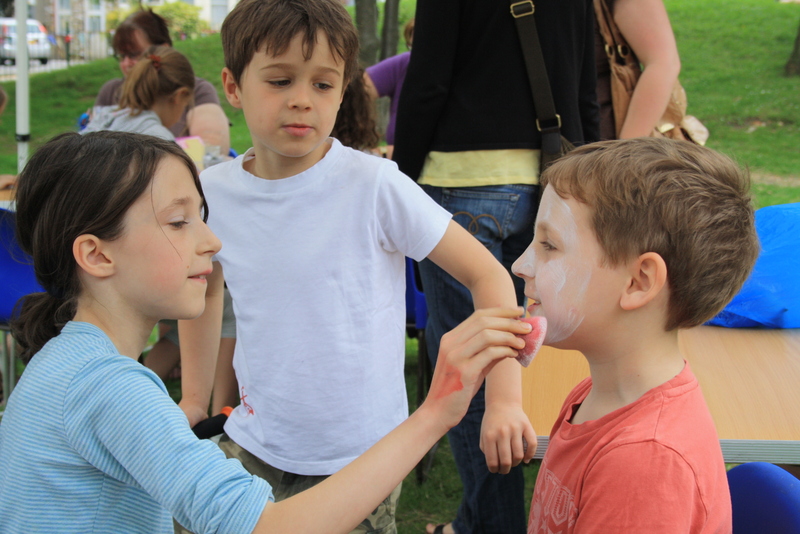 We put in for various activities & items including for more activities at this year’s Summer Fair. Monies are also there for a noticeboard, gazebos and a badgemaker. We are aiming to involve more community groups as well. The Friends committee will meet shortly to finalise the spending details. 2. 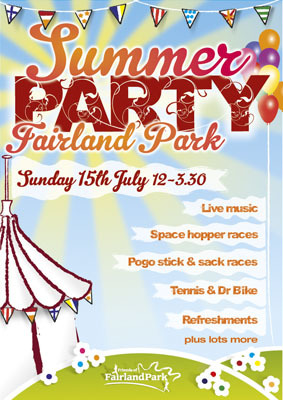 Fairland Park Summer Party is booked for Sunday July 12th, 12-4pm. 3. Re-development update: Groundwork have been appointed project managers by the council and have now gone away to arrange tendering and deal with a mountain of regulation & paperwork. Groundwork aim to have a chosen developer onsite by October. 4. This website has just hit 3000 views or hits since inception. The main interest is in this post. 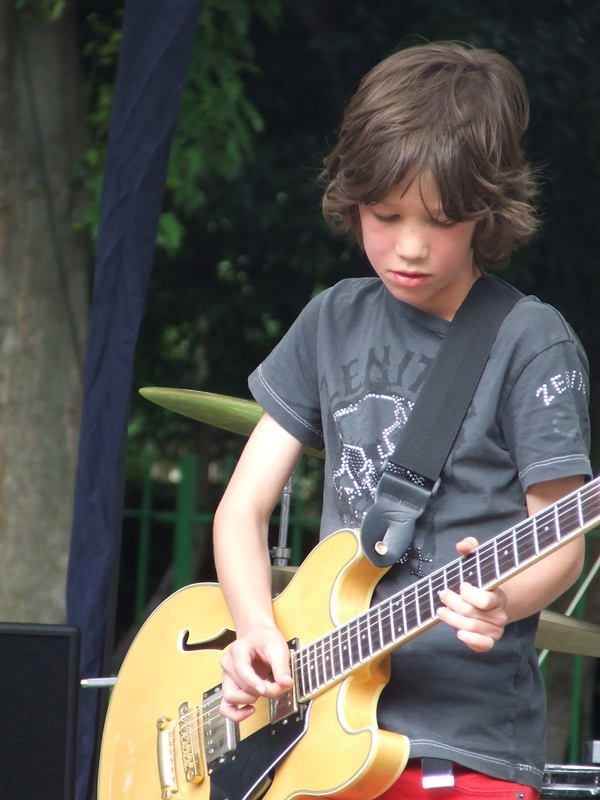 Locally, interest is of course more with our events and funding. 5. Will announce a date for a Friends Group meeting soon which will concentrate largely on organising this years Summer Fair in the park. It has finally been confirmed that our little open space is now officially called Fairland Park. For visitors from afar it has been known as Falkland Fairfax open space as these are the names of the two roads either side of the open space. In 2008 children at the local schools were given the chance to come up with a new name. They chose Fairland. Debate then moved onto whether we used the term ‘open space’, ‘common’ or ‘park’. The council had to have their input as well, particularly on the legality of using the word ‘park’. In the end the majority of local people went for ‘park’ and the council have just given the go-ahead. So there it is, a very small but important historical moment. The next generation will know it as Fairland Park! The re-development of our local open space has been given a significant boost with the announcement by the council that council funding has been secured. This is excellent news for our local community. Persistence has paid off with some very hard work from Paul Formosa (Community Development officer), staff at charity Groundwork and members of our Friends Group. The £150,000 from the council adds to £35,000 secured from London Marathon Trust. A Community Spaces application has been submitted (stage II) for £49,000. We hope to hear the good news from CS soon. 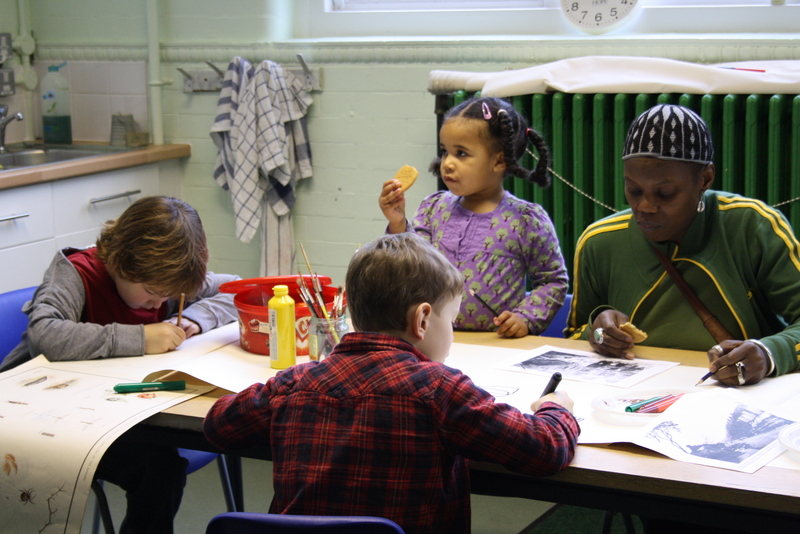 We have recently heard very good news from Community Spaces. We have been successful in our application for funds for £49,000. That takes our total for fund raising to £235,000 and means Groundwork will now move ahead to tendering stage soon. Funding update – Good news! 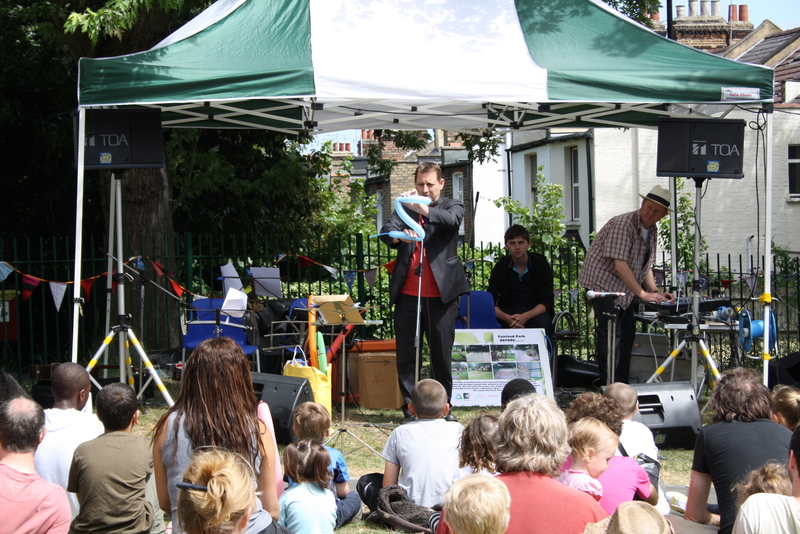 The Friends of the open space have been successful in securing £35,335 in funding from the London Marathon Trust. This is great news, a very positive and promising start! We have also been successful with getting through the first stage for the Community Spaces funding bid, which is for £46,000. There is a second stage still to get through on this one. The main monies we await are from council funding decisions, which is not due till the new year. Will keep you posted. P.S. See here for details of the open space re-development if you are not familiar with the plans. 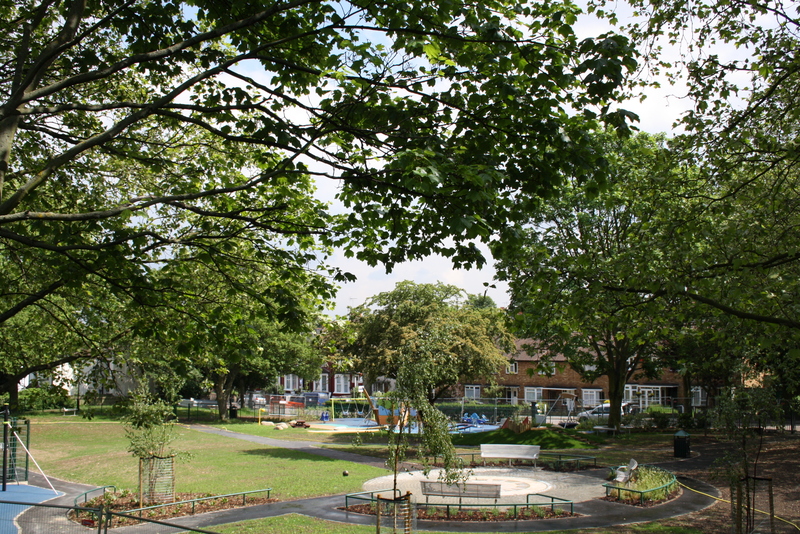 GreenSpace are a registered charity which works to improve parks and green spaces by raising awareness, involving communities and creating skilled professionals. The site runs a Community Network including a forum for all those questions about running events, fund raising and so on. 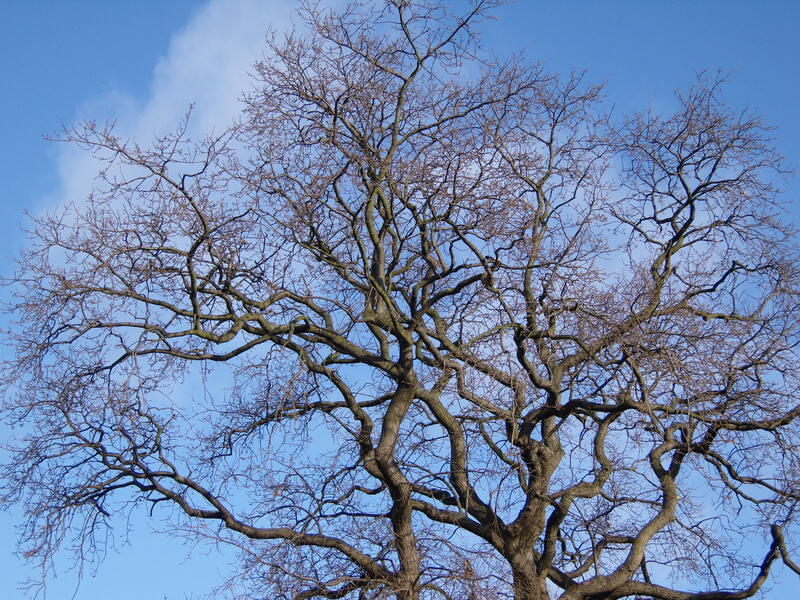 GreenSpaces advertises events, jobs and has a bi-monthly magazine with an online newsletter. 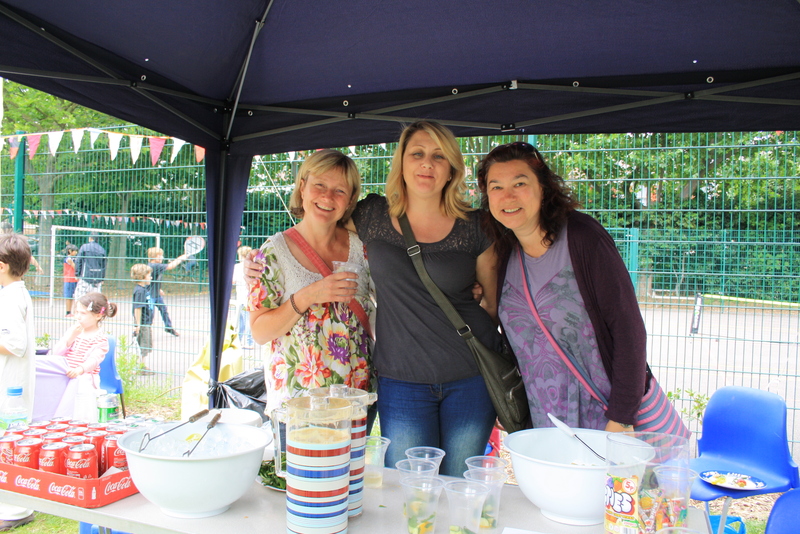 Ladder Summer fete photos – great event, thank you all! 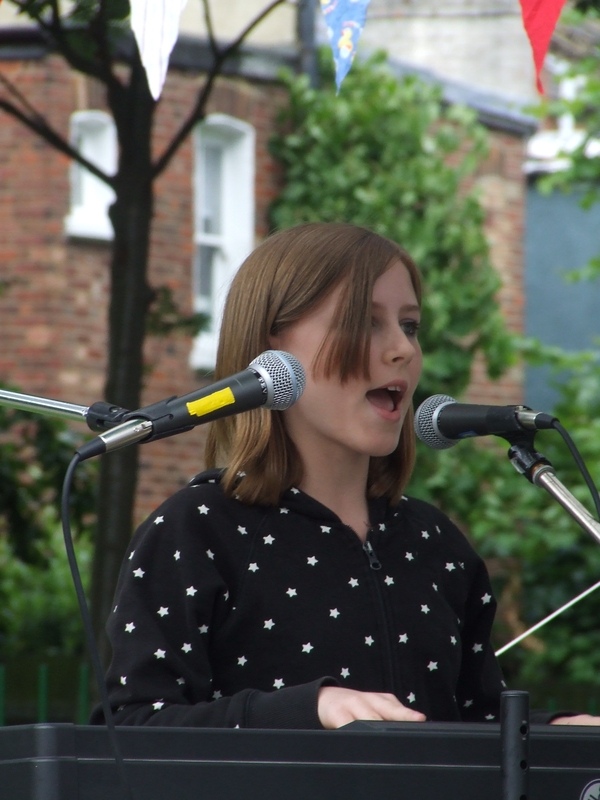 Thanks to Harringay online for these photos. 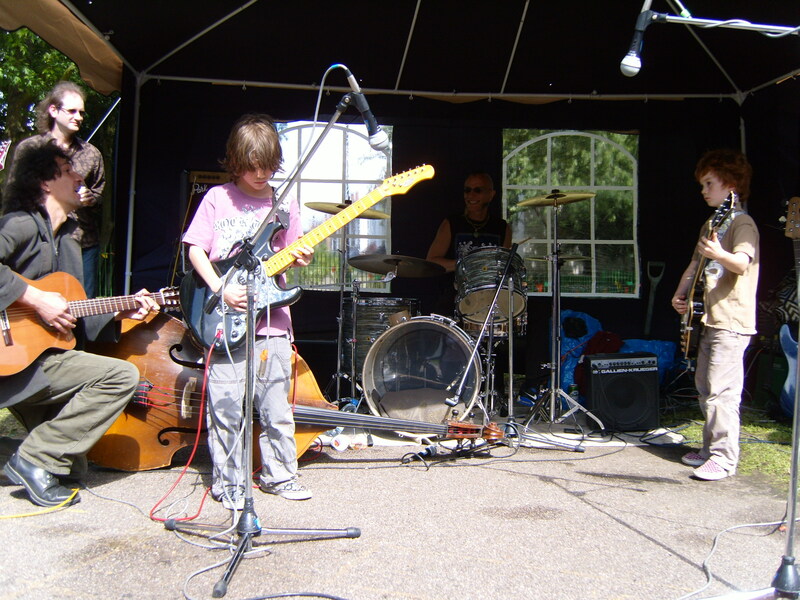 And thank you to Sarah Ninot for the following images, showing talented up and upcoming musicians … and the sack race. It was a fantastic day, with wonderful food brought along by all, excellent entertainment from local musicians, a salsa class, comedy, face painting and art yurt. And didn’t that sun shine! Thank you everyone for pulling it all together. Well over 300 people came along and I know that people thoroughly enjoyed themselves. It’s here! The social event of the year for ‘ladder’ residents. 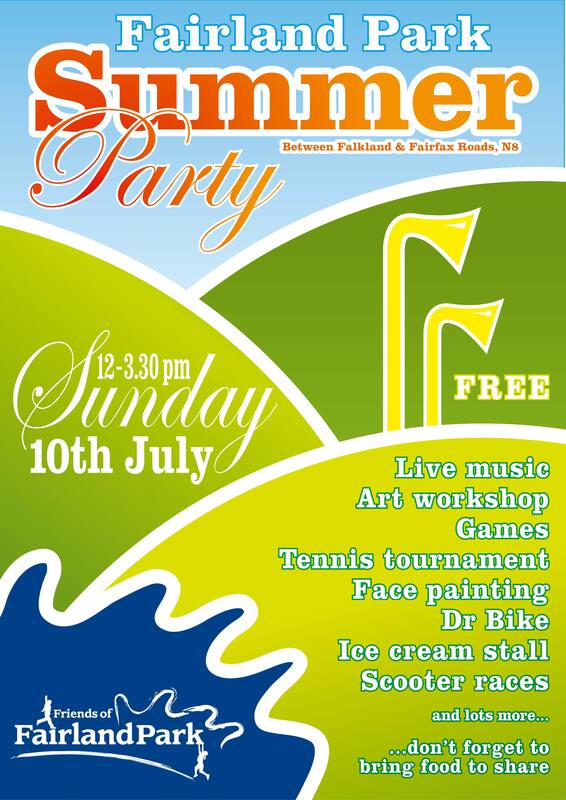 Sunday 13th July, 12 – 4pm. We are located between Falkland & Fairfax Rds. 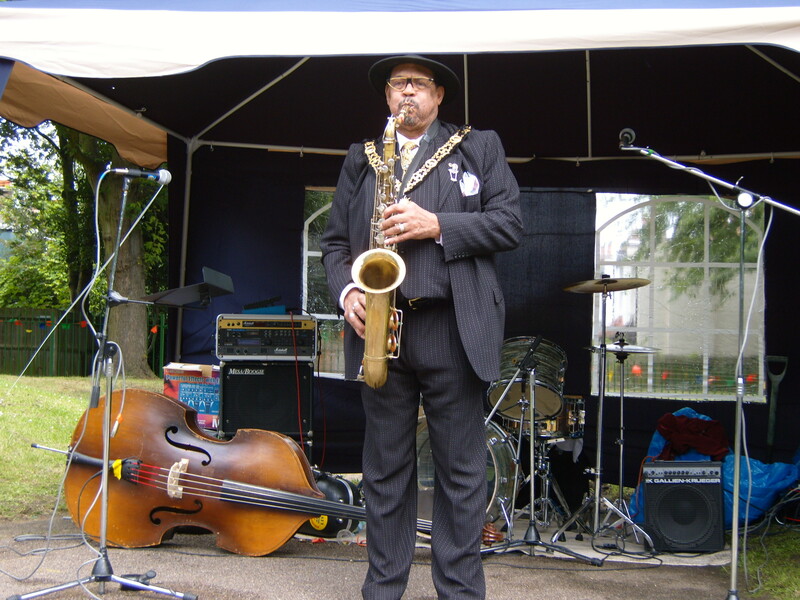 There is seriously fantastic entertainment lined up, with four bands, saxaphonist Shiek Thompson, a comedian, salsa, storytelling and face painting for the kids. Pop along with food to share and drink. 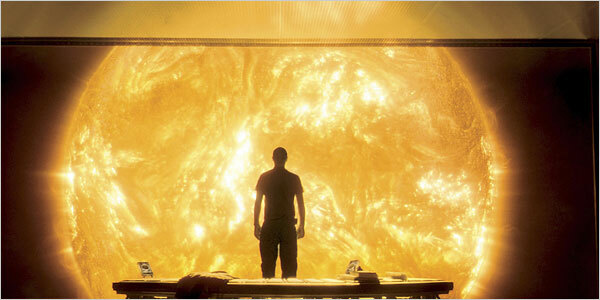 The AGM went well. We have Ruth Edwards as Secretary, Deborah Peacock as Treasurer & Matt Burge as Chair. There’s £246 in the bank, which is available for this year’s Ladder Summer Party if necessary. Adam has booked a story teller who costs £70 per example. The re-development plans are costed at £236,000 by charity Groundwork. The works will have to be phased as we get funding. 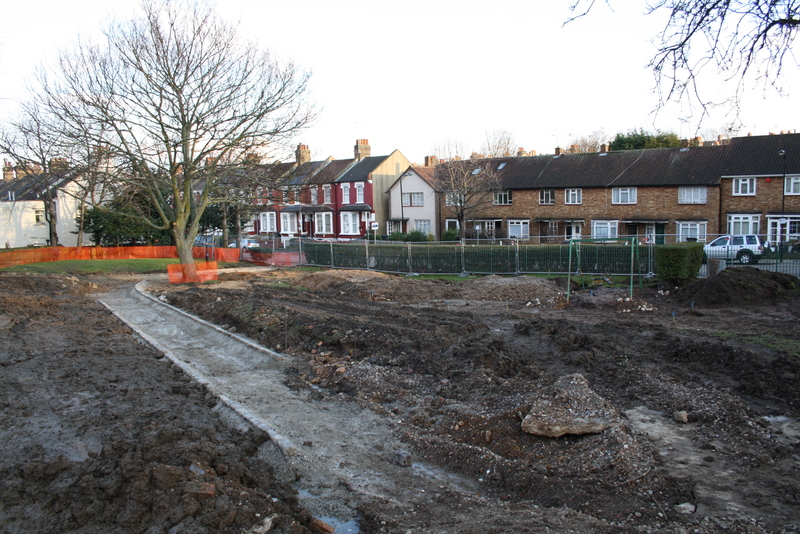 There was a separate meeting with the council & Groundwork last Friday. There’s a reasonable chance that the council will contribute a sizeable amount to this project. The rest will have to come from several outside funders. If anyone is interested in getting involved with fund raising please contact us via the ‘About’ page. The next (and last) meeting for organising this year’s Ladder Summer Party is on Wed July 2nd @ 8pm, in the Salisbury. See you there. Musicians especially welcome! 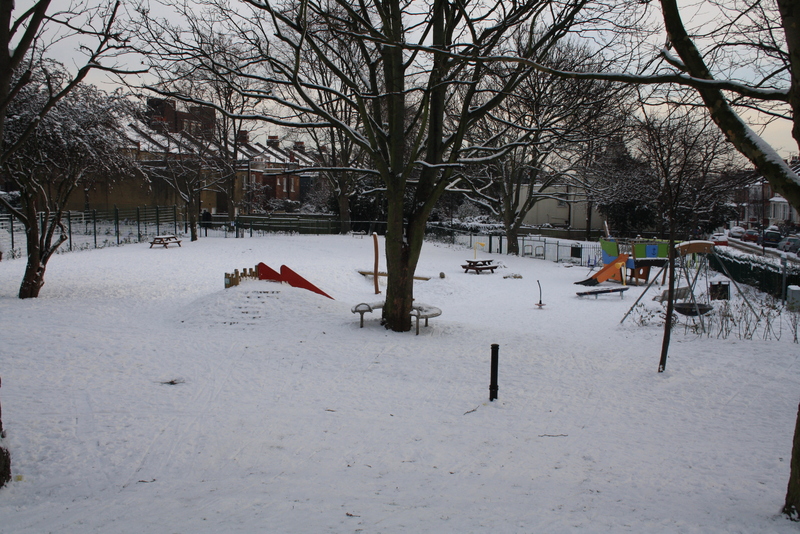 The children of North & South Harringay Primary schools are busy trying to come up with a name for the open space. I know that they are very excited about it. 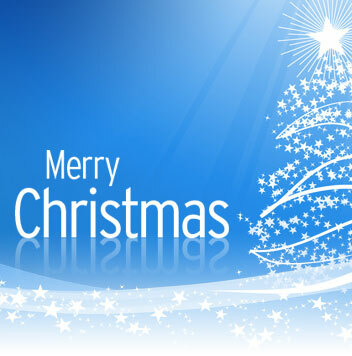 All entries have to be in by Monday 23rd to the respective head teachers. They are then meeting with their chair of governors and the Community Development Officer to decide the winner. I’ll announce the name here as soon I have it. The Friends of Falkland Fairfax Open Space (FFFOS) is having it’s AGM this coming Tuesday June 17th. 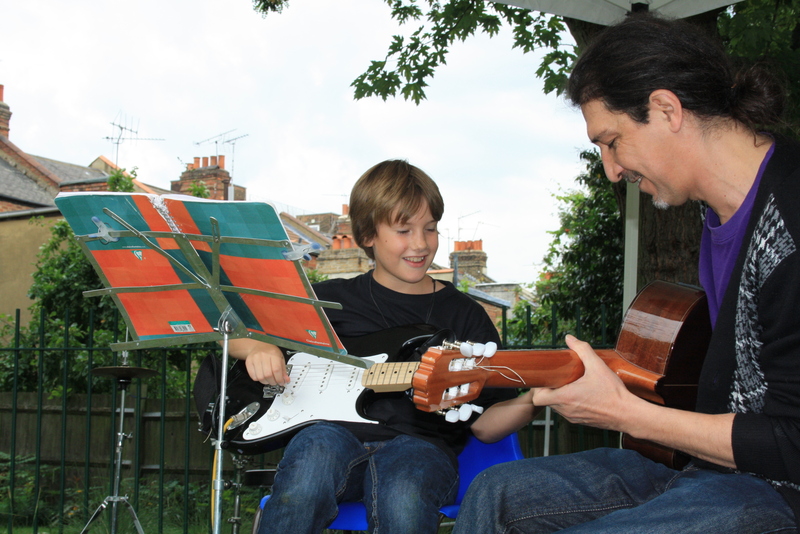 It starts at 7:30pm and will be held downstairs at the Falkland Centre, North Harringay Primary. 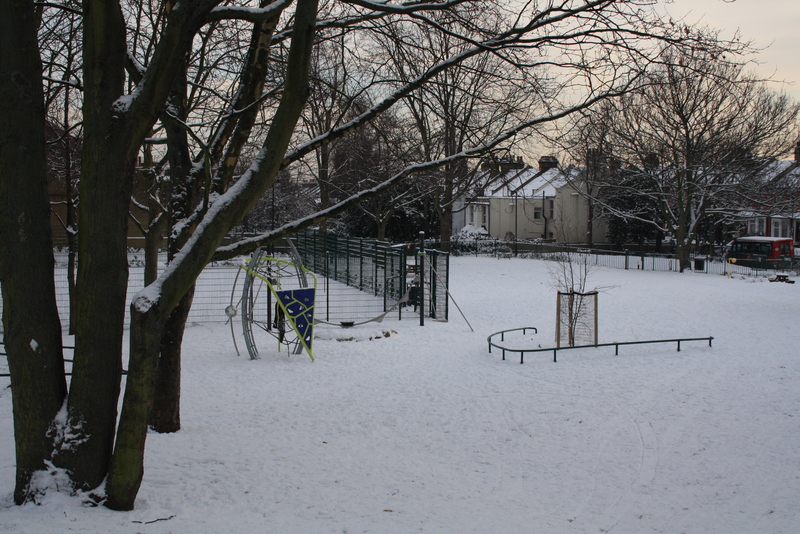 The Falkland Centre is accessible from a gate on Frobisher Rd, by Harringay Passage. If you are interested in any of above positions please email me and I’ll put your name down for the meeting. I’ll need to know by Monday June 16th. I hope you can attend. The meeting should wrap up by 9pm. Social drink afterwards …. possibly! 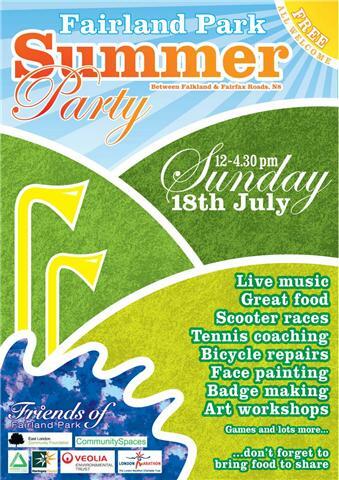 The Ladder Summer Party will held at the open space on Sunday July 13th. Pleaseput this into your diaries. It was a lot of fun last year. This year we are involving all the roads in the ladder. If you would like to get involved please let myself or Adam know. 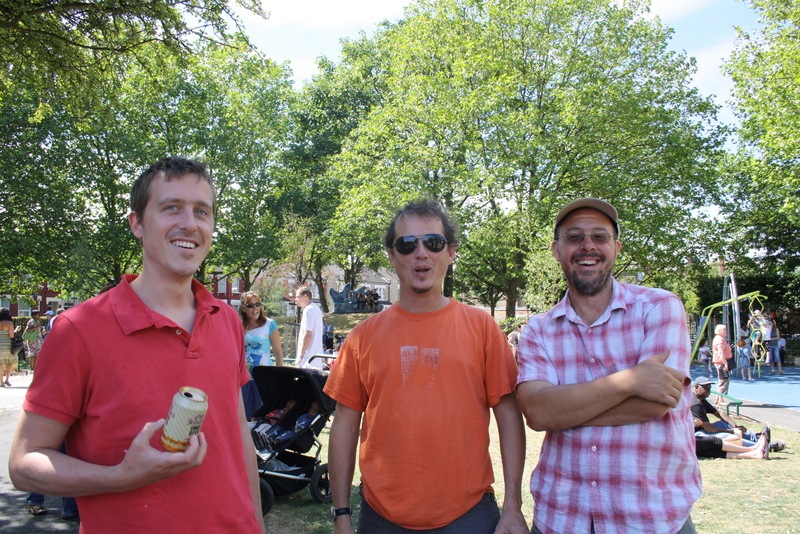 Or you can join the Party in the Park group at Harringay online. There is a meeting at The Salisbury at 8pm on Wednesday 21st May to discuss how we want to spend the money we have left in the budget. Please come along! Consultation – new design layout for the Open Space. Image: To enlarge the image please click on the image above and then click on it again, once it has loaded. The above design layout has been provided by the environment charity, Groundwork who have been working with the Open Space Working Group. The design is for consultation so if you have any thoughts regarding the above please do leave your thoughts by clicking on the ‘Comments‘ below. 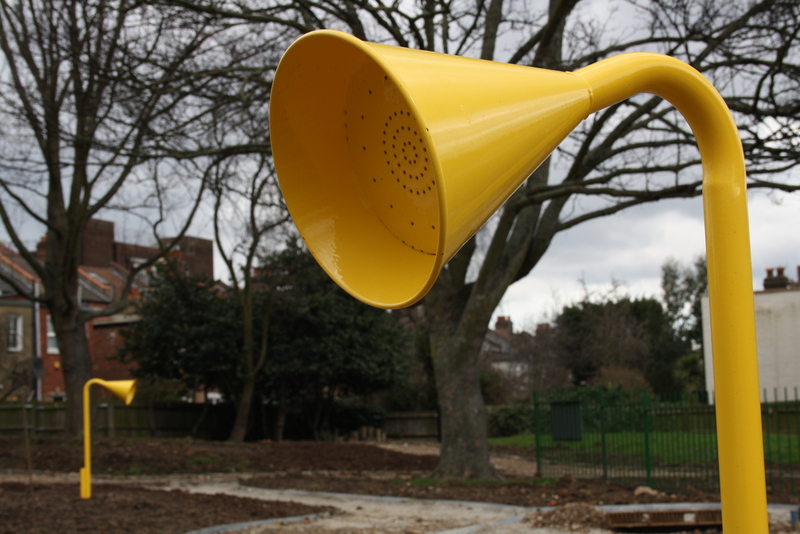 There will be other opportunities to put forward your ideas/views; bulb planting at the space this Saturday 9:30-11:30am and at North Harringay Primary. Other consultation events tba. To be able to enlarge the image please click on the image above and then click on it again once it has loaded. 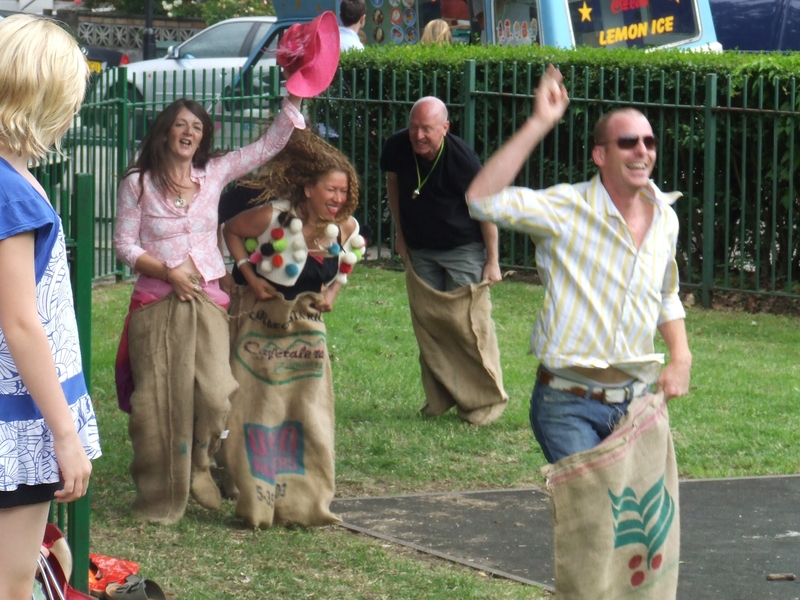 An Autumn event will take place at the Open Space on Sunday October 7th, 10am – 1pm. Please bring food along to share. At a Working Group meeting Monday 10th October the environmental charity Groundwork presented their findings on the current condition of the Falkland/Fairfax Open Space and put forward suggestions for improvement. Generally speaking play equipment unsurprisingly tops the list. There is also landscaping and keeping community space for street parties etc. Lots of good ideas came out of the meeting. The Working Group is made up of councillors, council officers and community representatives. A community consultation will begin later this year so that people can feed in their thoughts, wishes and ideas for improving the open space. This consultation will finish March 2008. From there the hard work of funding will begin! 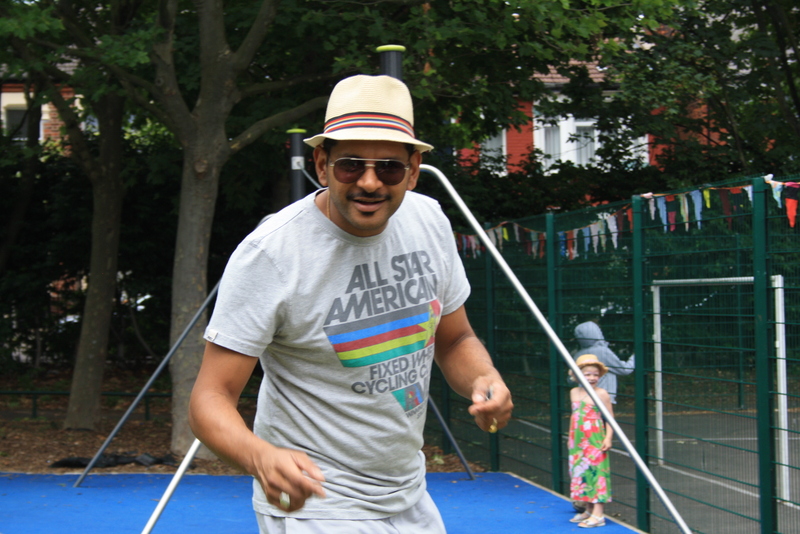 A great summer party was had! 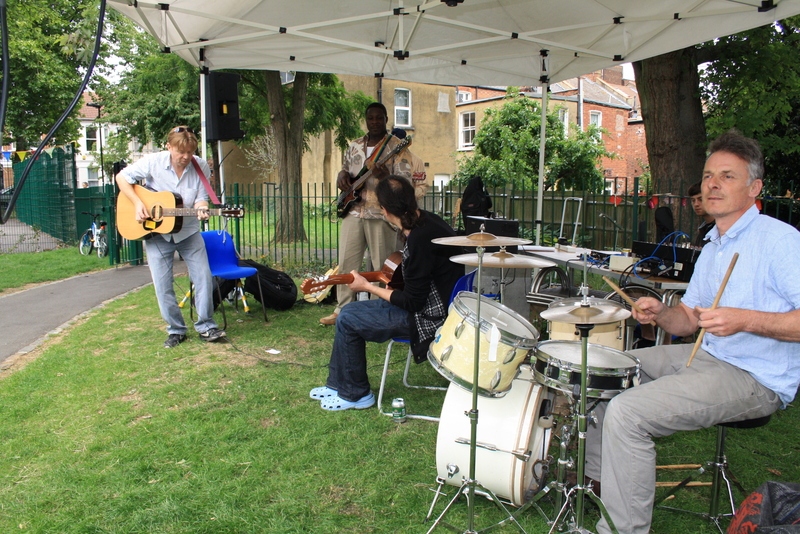 Photo: Haringey Mayor Sheik Thompson enjoyed the afternoon playing his saxophone, to the pleasant surprise of residents! It has taken a while to get these photos up because my digital camera had to be sent away for repair. A very good day was had by all. Thank you to the council for providing some last minute funding and to Adam and others for making the day a success. 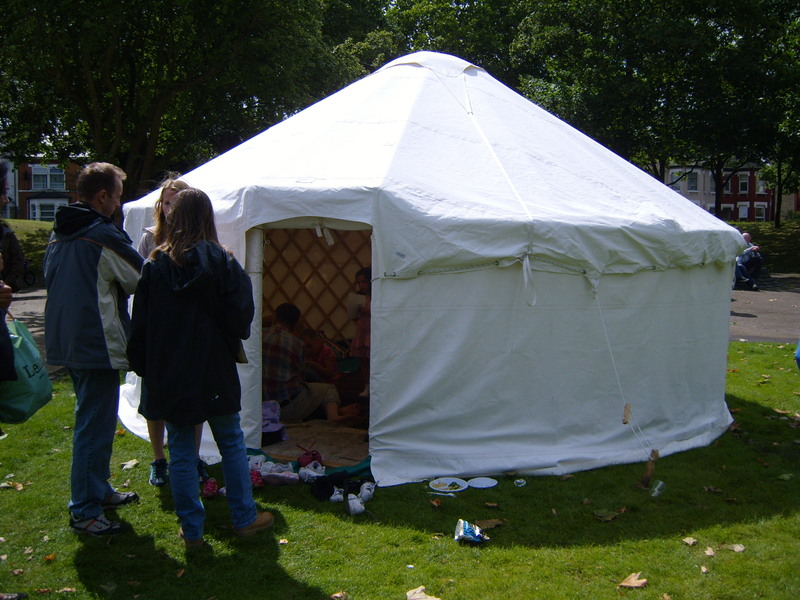 Photo: yes, even a yurt was provided by a local family! PS. Picnic tables have now been provided in the open space by the council for our still to arrive summer. The council officer says … demolition to proceed. 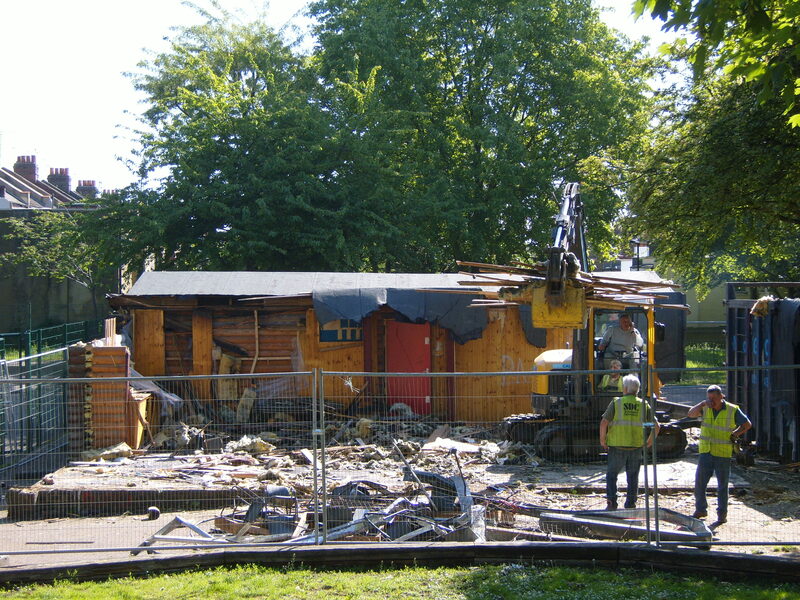 The council officer in charge of the demolition of the Log Cabins, Robert Farrell told me Friday that the demolition of the cabins will proceed this coming week, from Monday 21st May. He has given permission for this to be made public. The electrics were decommissioned on the 16th May. The demolition should take no longer than 2-3 weeks. The logs are being recycled by the council according to Mr Farrell. After demolition is complete the area will be grassed and some park furniture installed, according to Dasos, our area Community Development council officer. Adam had been to the meeting where the Council had been well represented with six councillors present. The Council had confirmed that Log cabins will be demolished end of March 2007. 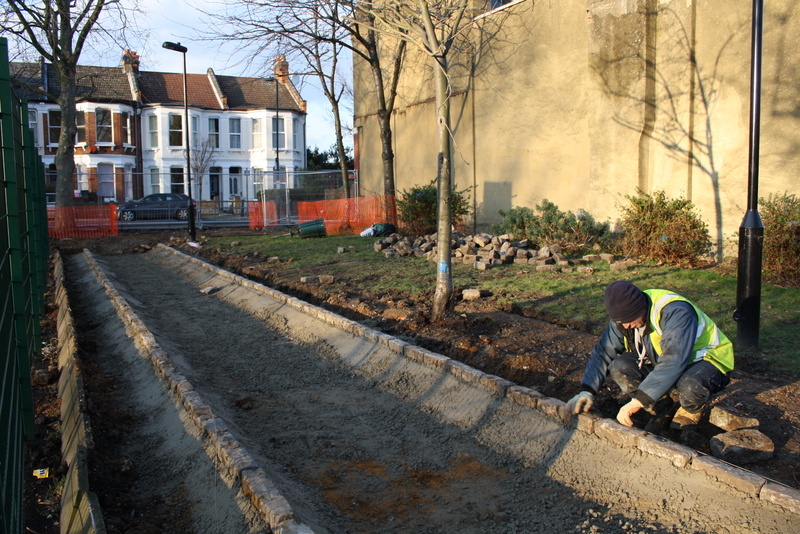 The concrete will be taken up and the surface grassed over. A power point and a water point will be put in the ground. New lighting has already been installed along the path at the eastern side of the park. The Council was planning to take away the internal fencing at the eastern side of the park during the demolition work. The fence will be stored and put up again at a later stage. The Council did not seem to have any plans or budget for further works in the park due to a lack of information about what the community wants. All in all it had been a very disappointing meeting with no new information from the Council. It had also been rather bizarre that the Council claimed to have no information on what the community wanted despite having had a community consultation day on the future of the open space in October 2006 and a number of meetings with various interest groups. Action: The meeting decided to send a letter to Councillor for the Environment, Brian Haley opposing the plans to take away the internal fencing as this would make the park less safe for children and increase the risk of dog messing and littering. Action: Chase up minutes/ information on the outcome of the October consultation day and follow up on the need for further meetings/consultation to ensure that the Council has all the information needed to draw up proper plans and a budget. The meeting agreed that it would be useful to have a notice board where e.g. meetings could be announced. We should ask for money from the Council. Adam is setting up a website for the Ladder area which could be used for information about the Open Space. Mr. M. O’Dean, whose property borders the Open Space, told how the activities in the park cause residents a lot of nuisance including broken windows, ruined fences (due to children climbing over to collect balls), subsidence from the trees, graffiti and noise. Mr O’Dean wished for the park to be better supervised. He suggested that CCTV was installed and that a sign saying no ball games after 7.30 pm was put up. The meeting also discussed the hedge between the ball court and Falkland Road. If the hedge came down it would improve the security but some Falkland Road residents rely on the hedge to reduce the noise from the ball court. There will be an Area Assembly Meeting on 5 March 2007 where these issues could be brought up. It is possible to apply for funding through the Council’s ‘Making the Difference’ grants scheme. Bids have to be in by 16th March 2007. All the different groups with an interest in the Open Space should put in bids. 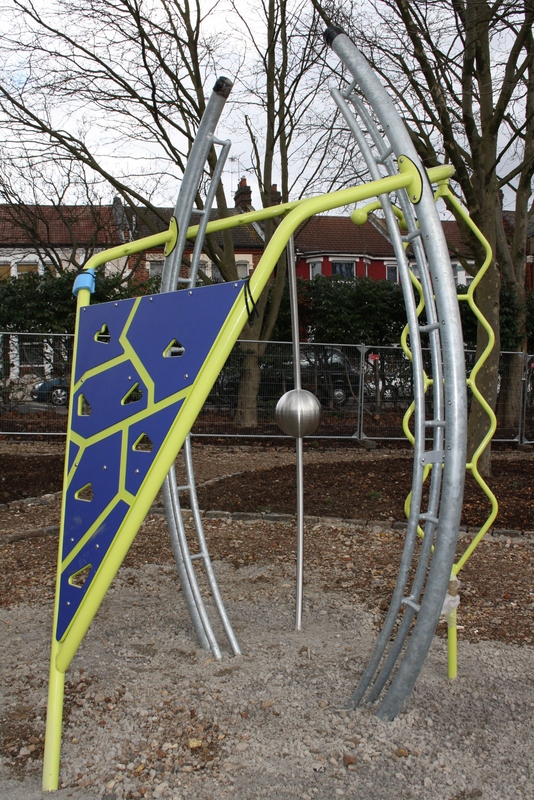 Action: Matt to apply for funding of play equipment and park furniture on behalf of FFFOS. Adam to get more leaflets to hand out to potential bidders. The spring event will be on Saturday 24th March 2007 at 10.30 am provided that this will not clash with the demolition work. An alternative date was set to 21st April 2007. There will be an Easter Egg Hunt, tea and cakes, seed planting and face painting. – Adam to check when demolition will take place and if there will be a power point installed. It was agreed that Sunday was not a good meeting day because it may make it difficult to for those who wish to attend church to come to the meeting. The next meeting will be held on Saturday 10 March at 9.30am at the Falkland Centre, North Harringay Primary School. Thank you for your letter dated 14 February 2007. The issue of removing the railings surrounding the Log Cabins was raised and discussed at the last meeting of the Working Group held on 29 January 2007. The Working Group agreed to remove the railings with the proviso that if there was evidence to suggest that the railings, after the Log Cabins had been removed, were required they would be replaced and that in the meantime the railings would be safely stored away. This decision was taken on the basis that the Working Party will be working towards developing a phased programme of works to up grade the open space and with the removal of the railings this would have provided more options in the future design and use of this space. I have now discussed the issues you have raised with Cllr Adamou the Chair of the Working Group, and appropriate officers of the Council. It has been confirmed that the demolition of the Log Cabins can proceed without the removal of the railings albeit that some may have to be temporarily removed for access to the site and then replaced. In view of this, both I and Councillor Adamou have agreed not remove the railings as part of the demolition of the Log Cabins. 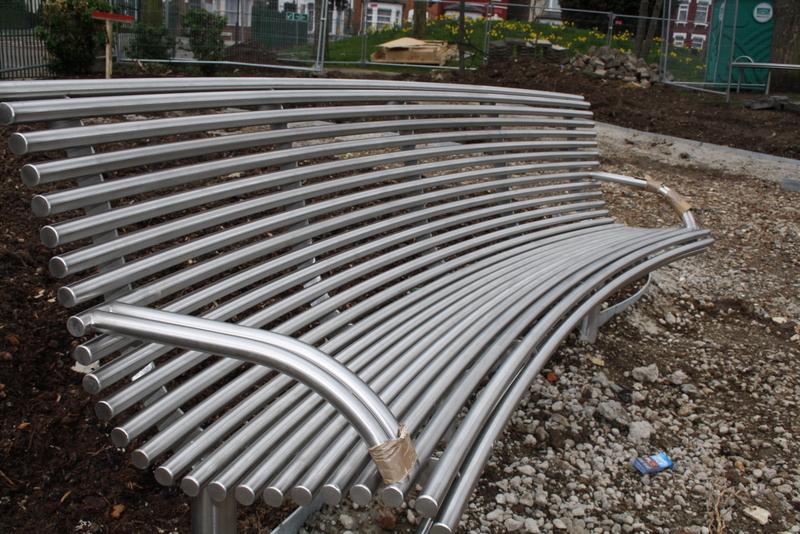 I have to point out that, if it is proposed to move or remove the railings at a future date, the cost of this will have to be found from any future resources made available. As you know the public consultation held in October last year was organised following meetings of the Working Group which first met on 10 August 2006. The public meeting held in October was to give the wider community an opportunity to feed back to the Council their views about the future use of the open space. The Working Group is the appropriate body to discuss the details of any proposals for the open space and the principle of the demolition of the Log Cabins was agreed by the Working Group and sanctioned at a meeting of the Area Assembly in November 2006. Further public consultations will of course take place as the programme for improvements are developed however, it is impracticable to consult the wider community on matters of detail and it is clear that the Working Group is the appointed body to discuss such matters and therefore, I cannot accept that the appropriate consultation had not taken place in respect of the demolition of the Log Cabins including the details regarding the fencing. I again confirm that there are no proposals to sell this open space for the purposes of Housing Development and I am surprised that residents still refer to unfounded statements being made rather than the assurances I have already given at the Working Group and the Area Assembly. I hope that this addresses the issues you have raised and my understanding is that the demolition will take place before the end of this financial year. The following letter has been sent to councillor for the environment, Brian Haley (by email & hard copy – which has been signed). This action was agreed at the recent FFFOS meeting (minutes to be posted). We wish to urgently communicate that we do not want the council to take away the internal fence of the Falkland/Fairfax open space, at the east edge of the space, going from the ball court to Fairfax Rd. • There would be a significant health and safety issue with young children wandering directly from the open space area onto the street. A good example of this would be down by the play roundabout, which is only a few metres from the road. • It would increase the already antisocial problem of dog owners letting their dogs foul the area. Currently the play area is separated from another area of the open space to which most dog owners use. There has been a lack of consultation on this decision, which we think is unacceptable. As a specific issue this was not spoken about in the consultation day at the end of 2006. We would like an urgent response to the above points. Whilst writing, we also want to draw your attention to the fact that one of the workmen who was installing new lights to the open space this week, took upon himself to tell a resident that the open space is earmarked for housing development. We assume this is misinformation as you have yourself publicly denied this possibility, but we ask that you put this in writing to ourselves that housing development is not allowed upon this open space land. Carolyn Baker, Dasos Maliotis, Gina Adamou, Karen Alexander, Paul Formosa. Installation of lighting to through path at Open Space. FFFOS’s principal fund raiser for the Open Space, Adam Coffman, who sits on the FFFOS committee was recently successful with a Make the Difference bid for extra lighting for the Open Space. The photo above shows one of four new lights that have been positioned along the through path. Well done Adam for a successful bid! Friends of Falkland & Fairfax Open Space (FFFOS) committee meeting with Community Development Officer, 05/12/2006. The next event should be before the Easter break-up, possibly on Saturday 24 March 2007. Activities could include bulb planting, Easter egg hunt, face painting, tea/coffee and food. We should also get people’s views on future play equipment etc. An event’s insurance will probably be necessary (£80). Funding for the event could be obtained from e.g. the Police Property Fund and UK villages. Paul offered to make the event posters. The Friends of Falkland & Fairfax Open Space (FFFOS) will continue collecting e-mail addresses to add to the send list (e.g. at their meeting in February 2007 and at the March event). Demolition of the log cabin building will start in February 2007. Lighting will be improved and the ball court will be resurfaced after the drainage has been sorted out. New goals will be put in before spring. Agreed that the open space is cleaned regularly. We need to find out what play equipment the children want. We can get views at the March event. There is no funding for equipment in this year’s council budget. Recreation Services (Lou Taylor) is trying to secure funding. Paul will check if it possible to get a power point and a marquee. Paul agreed to help where possible with this, particularly passing on sources to FFFOS as he comes across them. Next FFFOS group meeting; Sunday 11th February, 11am, Falkland Centre (entrance from Frobisher Rd ). a. Log cabins will be removed by the end of March. b. This area will be prepared for grassing over. d. The internal railings are to be removed & stored, taking advantage of current demolition monies. Those that agreed to this motion/idea thought it would help to open up the space & allow greater scope with re-designing the layout of the space later. The railings could be used elsewhere within the space once everyone has agreed to a new layout. e. An electricity and water point will be provided. Useful for events, as asked for by FFFOS. The next meeting is in March and will include first discussions on a new layout for the space and what this could include. It will be a ‘phased’ development as and when monies are available. If you have any thoughts/questions on the above please comment here or contact Adam or Matt. Dasos & Paul Formosa at the Community Development team can also be contacted via ph.84890000. They are helping with the phased works. on: Sunday 11th Febuary, 11am. The meeting should last about one hour. A web space for our open space. This site is for all of us to share information regarding the open space, particularly regarding planned improvements and community events, as well as for discussion of desired improvements and uses for the space. Please feel free to comment regarding these aspects.